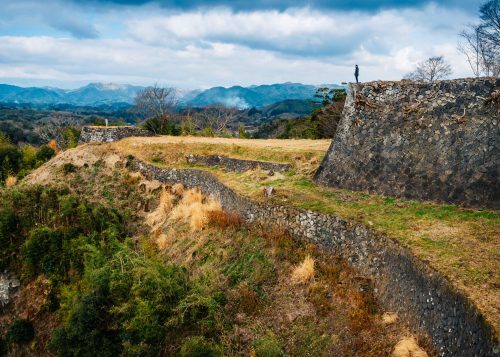 A trip to Shikoku – the smallest of the four Japanese archipelago islands – is a unique opportunity to discover some of Japan’s most protected and preserved areas. 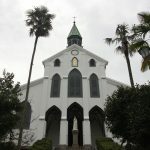 In the Eastern part of the island, consisting of Tokushima and Kagawa Prefectures, you will discover wild and untamed natural landscapes, meet the members of rural villages established on the steep wooded mountainsides, walk centuries old streets of historic districts and learn the secrets of local traditional crafts. 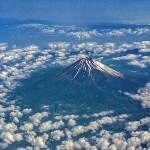 It’s a voyage that will change the perspective of even seasoned travelers to Japan. 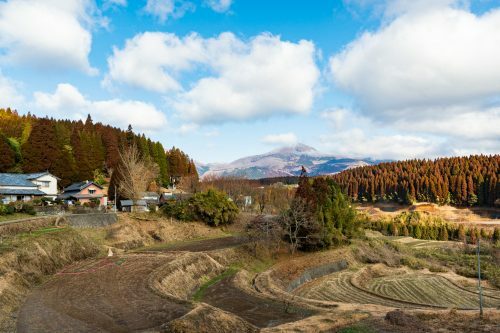 Tip#1: Travelling to a preserved and secluded part of Japan means the transportation system is not as developed as in the city. When planning your visit, please note that the suggested tour below is ideal for people who plan to travel by car which is the best way to get around this area. Tip #2: All the practical information (opening hours, ticket fares, etc.) 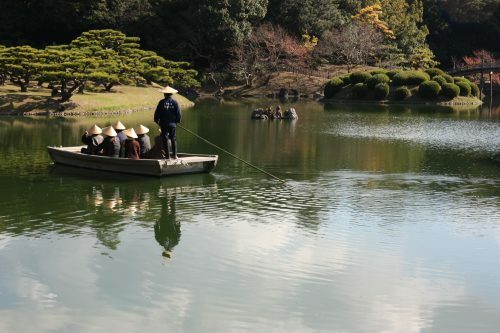 corresponding to the sightseeing spots introduced below can be found on the clickable map at the end of the article. 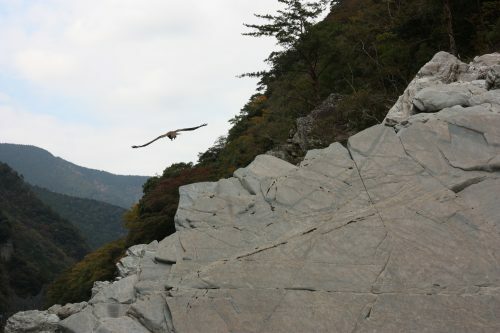 So let’s start this itinerary to discover the Eastern Shikoku with the stunning and mysterious Iya Valley, located in Tokushima Prefecture. 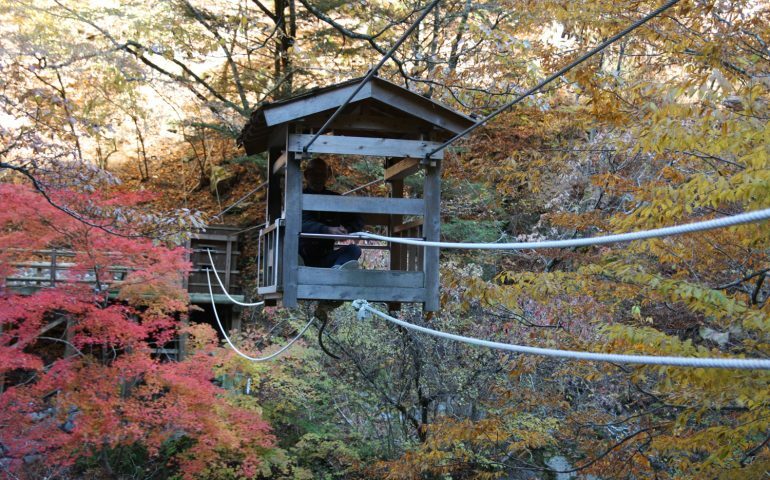 Traveling there at the very end of October, the timing was ideal to explore the area in vibrant autumn colors. 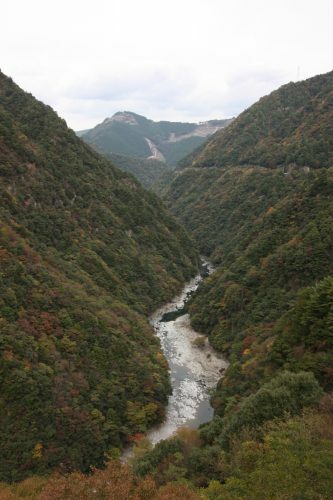 To wander in the Iya Valley is to uncover a beautiful, preserved part of Japan, driving through narrow mountain roads winding through lush forests. 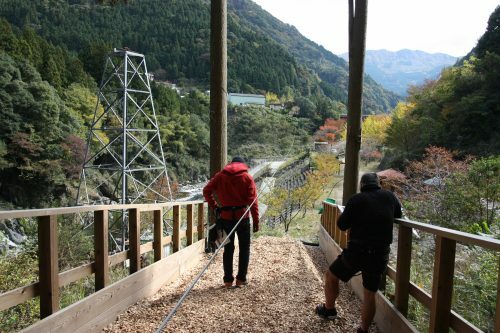 Here is a part of Japan that will appeal to the most adventurous travellers, those who are eager to cross vine suspended bridges and to try out river rafting or zip lining! 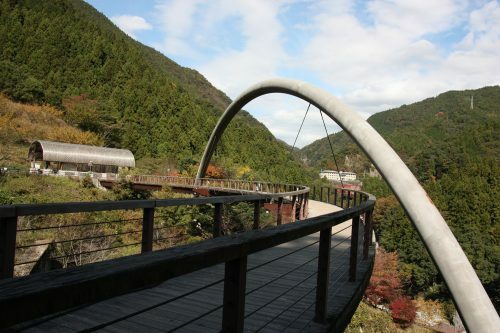 Our first destination is one of the most well-known sightseeing spots of the valley, whose beauty attracts many visitors from Japan and beyond: the vine bridges, or Kazurabashi, of Oku Iya. 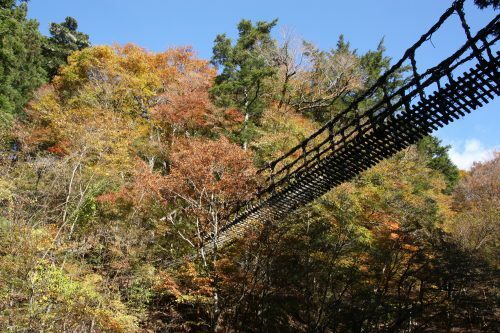 Only three of these types of bridges now remain (two in Oku Iya and a third one – the most famous one – in Nishi Iya), but there was a time when thirteen of them were constructed to make it easier to cross the valley. 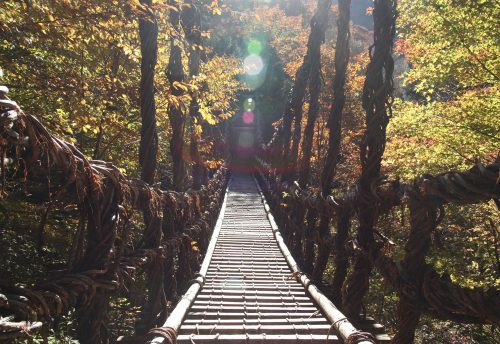 With wide gaps between the planks under your feet, the slight creaking and swaying with every step, these bridges come straight out of an Indiana Jones movie and will get your heart racing! 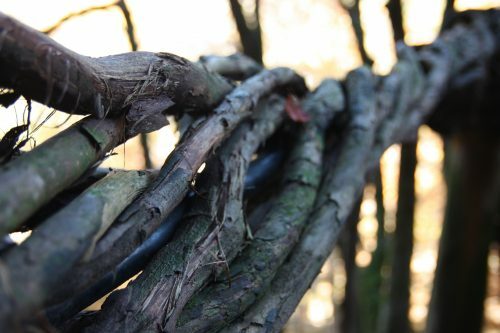 No need to worry though, as nowadays steel cables are hidden under the vines for increased safety and the bridges are renovated every three years. 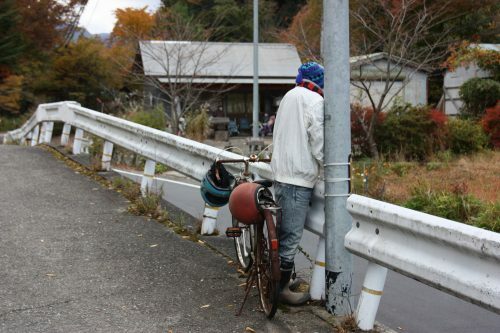 As with many things in Japan, safety first! 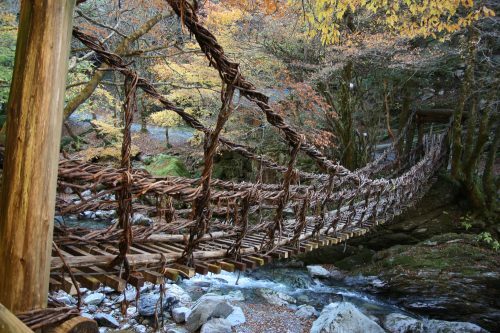 Another unusual option is also available to reach the other side of the river, a sort of small wooden cabin that can be moved through a smart system of cords and pulleys, nicknamed the wild monkey bridge. Once you have taken a seat aboard it, you will simply have to pull one of the two cords to start crossing the valley at your own pace. 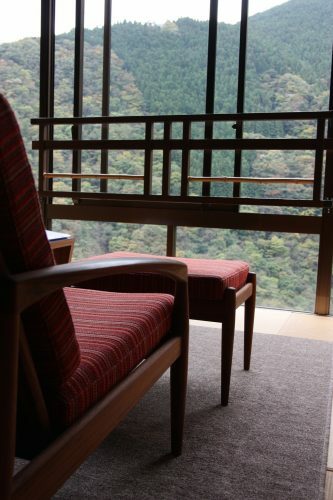 Perched high above the river, make a stop halfway to enjoy the view on the valley below. If you’re not a fan of high places, you can hike to the river bank from which you will be able to view the bridges from below. 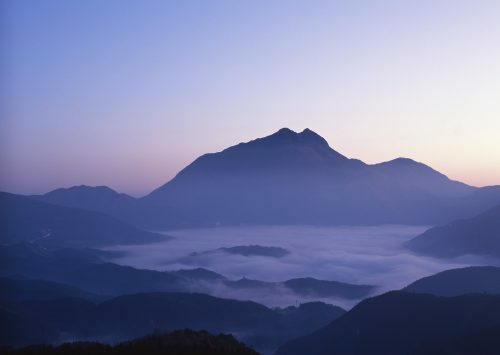 Surrounded by small waterfalls and rocks, the view is just as breathtaking! 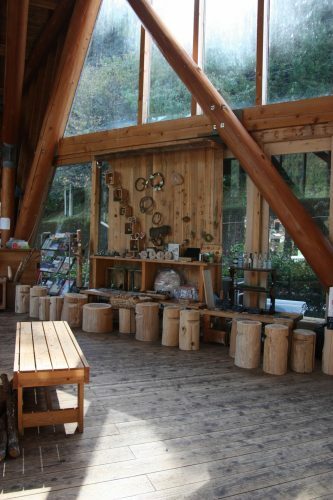 With our appetites for adventure now whetted, let’s head to the nearby treetop adventure park Forest Adventure. 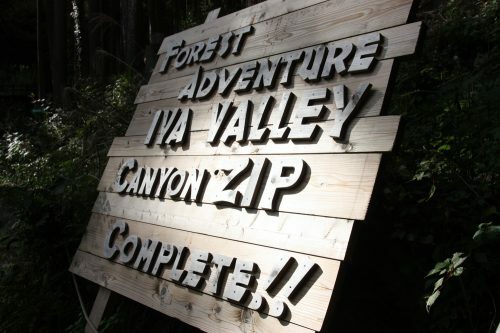 You will be welcomed here by a very professional and reassuring staff before crossing the valley on a zip line! 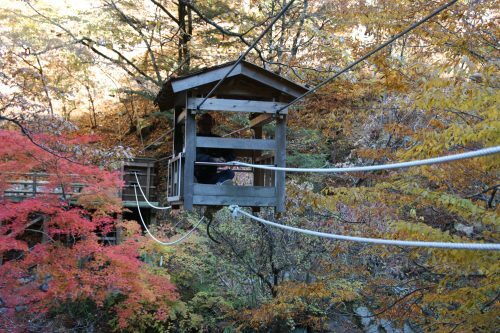 A 360 meter long glide during which you will see the dense forest around you and clear river below pass by at breathtaking speed. You might even want to do it again, but today, we need to keep on our schedule. 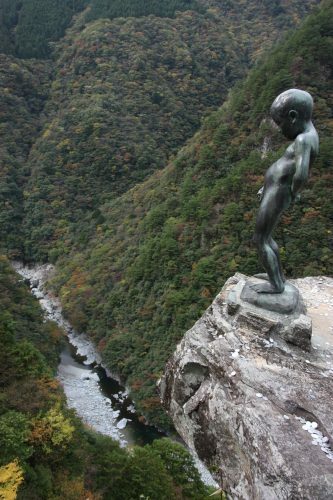 A few kilometers further into the valley, another panoramic spot awaits you in a rather unusual setting, with the statue of a little peeing boy similar to the Manneken-Pis in Brussels, perched 200 meters above the valley floor. Enough to make you feel dizzy! Our next stop is the village of Nagoro, which is unusual in that the number of non-living inhabitants outnumber the living. But it’s not the way you think. 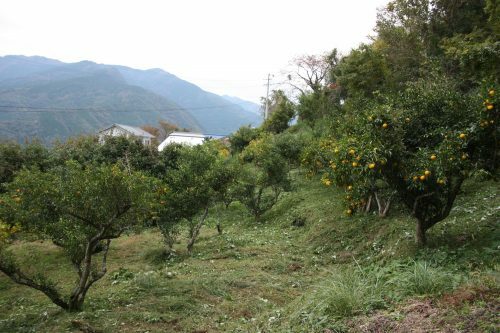 Nagoro is also known as Kakashi no Sato, “The Scarecrow Village”. 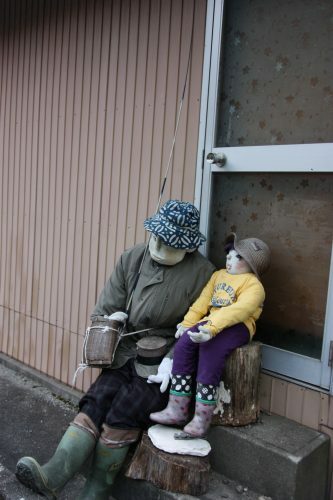 As the actual population keeps decreasing here – only twenty villagers remaining – the number of scarecrows to be found in the village is always on the rise, around 270 today! 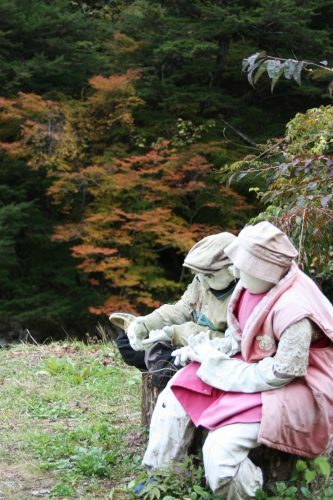 Far from being simple wooden sticks topped with a hat, these scarecrows all have the physical appearance of real people, with every little detail carefully thought through: the hair color, poses, and choice of clothes. Inspired by current or former inhabitants of the village, they bring a whimsical presence to every street corner, or even the abandoned school. 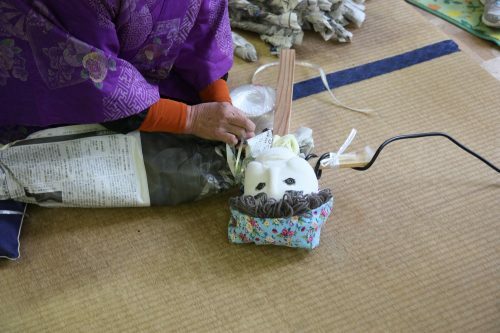 While walking around, you might come across their creator, Mrs. Tsukimi Ayano, busy bringing to life Nagoro’s next resident with a master’s touch. 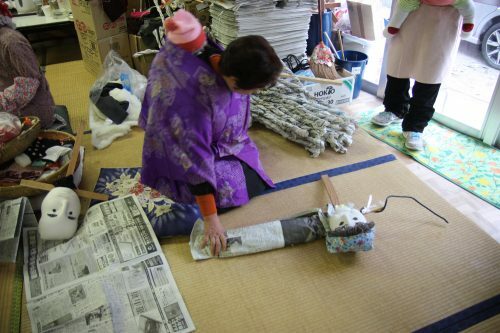 She will be glad to show you her creative process, starting with only a bunch of newspaper and iron wires. 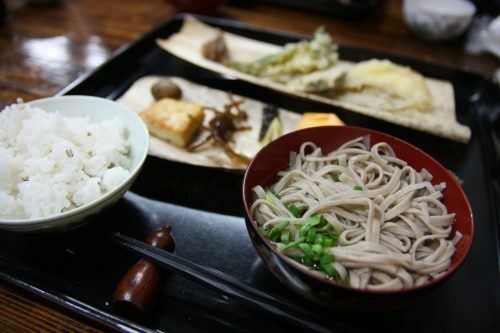 As for local cuisine, you will have the opportunity to not only taste the region’s famous soba noodles, but also to make some of your own! 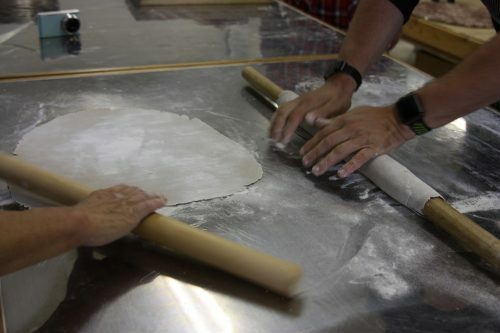 Head to Mrs. Tsuzuki’s kitchen for a workshop led with patience, care and precision. 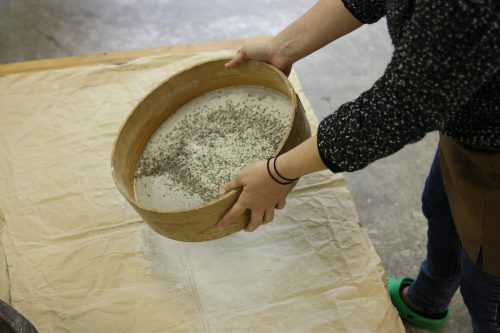 The experience starts with learning how to mill the buckwheat using an old millstone to produce homemade flour, before we can even start cooking. 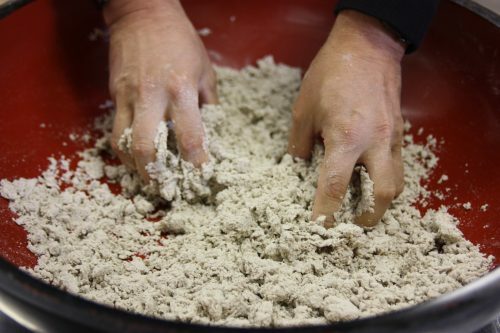 Next we learn the process of mixing the dough, kneading it, stretching it and finally very thinly slicing it, ending in a tasting session of the fruits of our labor! 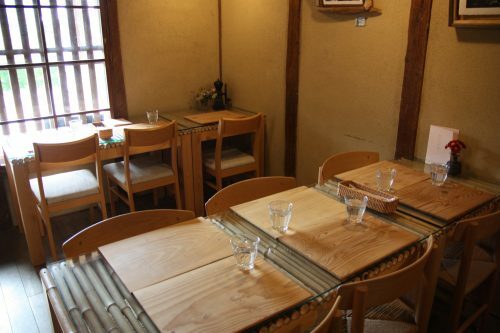 Remove your apron and find a seat in the adjacent building to get a taste of your homemade soba noodles, served with seasonal vegetable tempura and a comforting cup of hot tea, while chatting with the lovely Mrs. Tsuzuki who is quite the local celebrity! 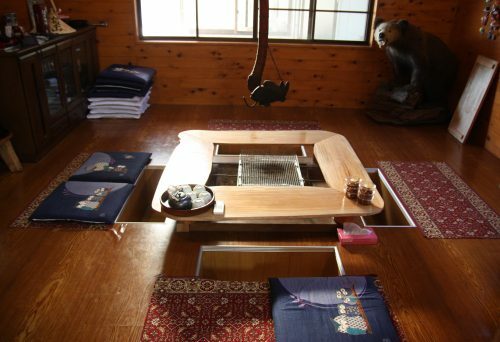 In order to fully immerse yourself in the quiet seclusion of this part of Japan, we recommend that you spend at least one night there. 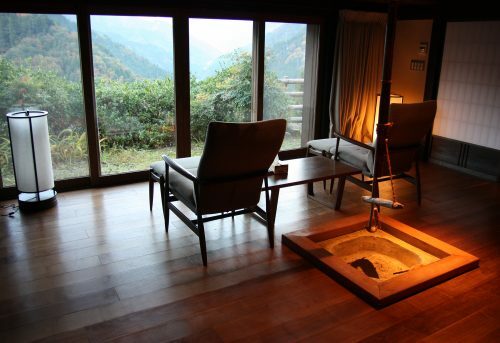 You can choose to unpack your bags in the heart of the valley, at the Iya Onsen Hotel. 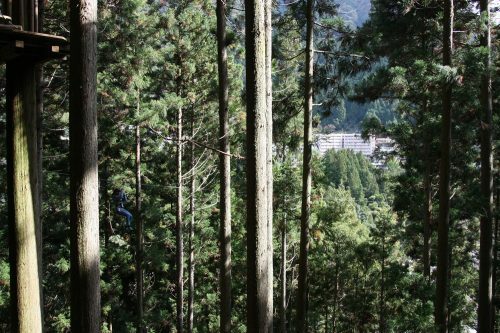 Standing tall above the forest covered slopes since 1972, this hotel offers its guests an incredible panoramic view from every one of its rooms. 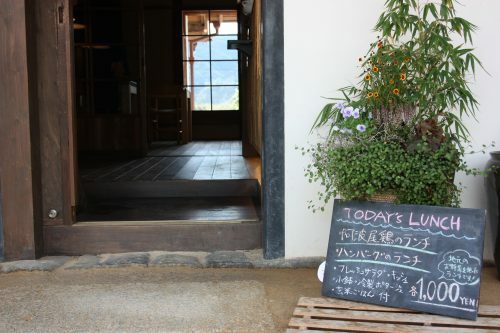 The Iya Onsen Hotel is a peaceful place for relaxation and sanguine contemplation. 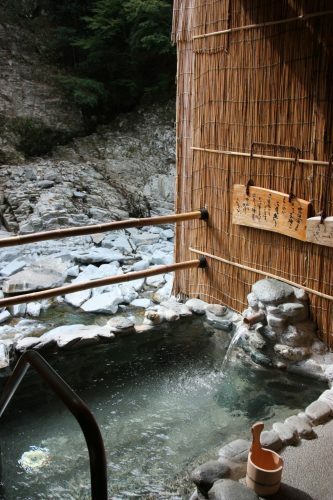 And as its name suggests it, the hotel comes with an onsen, a bath filled with naturally hot spring water. 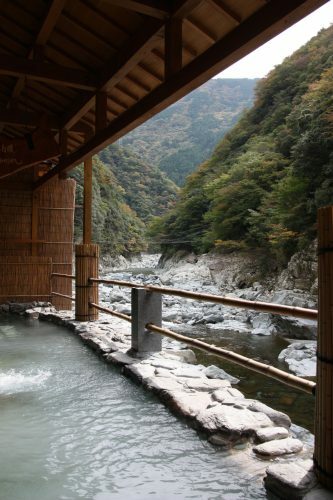 Getting to the onsen at this hotel is an adventure in itself. The only way to access it? 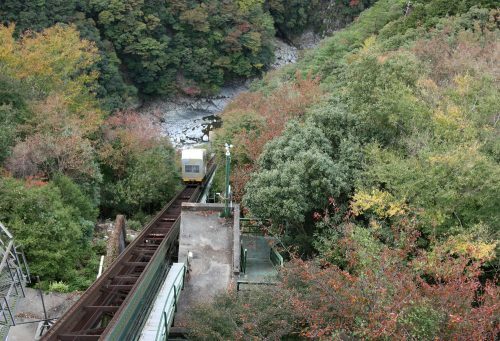 Climbing aboard a cable car that will take you down the steep slope from the hotel to reach the river bank 170 meters below. 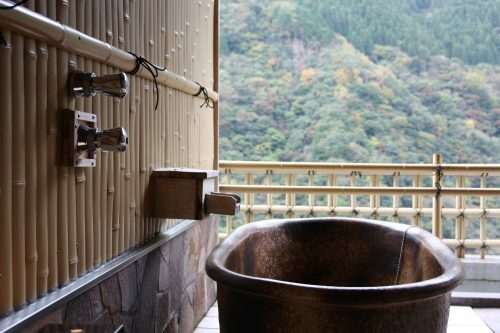 Here in the heart of the Iya Valley you will be able to leave all your cares behind by submerging yourself in a steaming bath with a view of the surrounding nature. 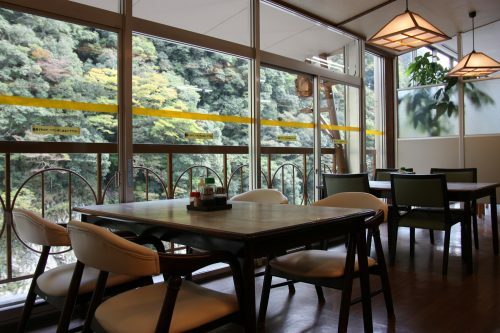 The hotel also has a restaurant enclosed by large bay windows, allowing you to constantly enjoy the outdoor scenery. 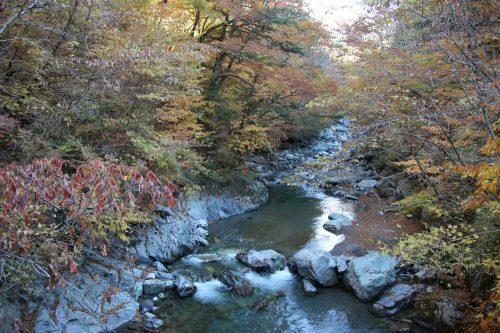 Rather than going down into Iya Valley, you can also choose to drive further and higher on the narrow winding roads of Miyoshi to reach the hamlet of Ochiai. 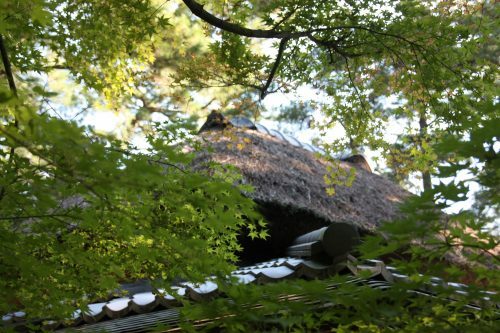 There you will find traditional Japanese houses with thatched roofs that have been renovated to welcome traveling visitors. 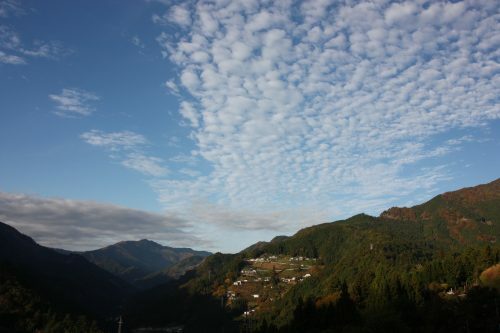 Staying in one of these houses is a unique opportunity to discover the lifestyle of the local communities, who settled in the mountains centuries ago, learning to farm in a harsh environment. 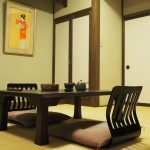 The houses, available for rent, blend the charm and aesthetics of traditional Japanese homes with the comfort of more modern interiors such as fully equipped kitchens and heated floors. 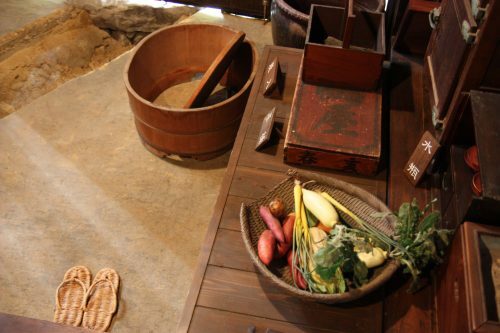 Such appliances allow you to bring your own food and cook in the house during your stay, or if you prefer, you can have a lady from a neighboring home come over to cook a local meal for you. 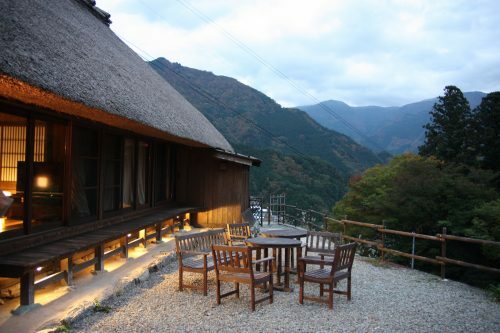 And while you fall asleep under the thick thatched roof in the silence of the mountains, you imagine the life of its former residents from decades, even centuries ago. A bell tower ringing in the distance accompanied by the barks of a few dogs will likely wake you up at dawn the following day. 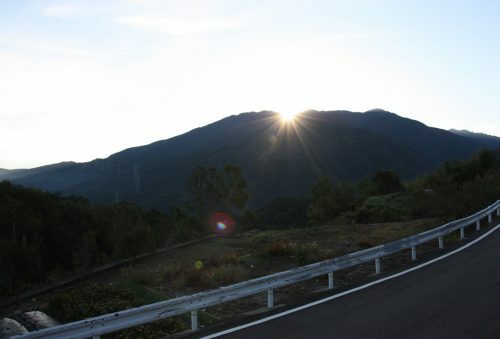 But the view of the first rays of the sun on the mountain tops awaiting you will make you jump out of bed. 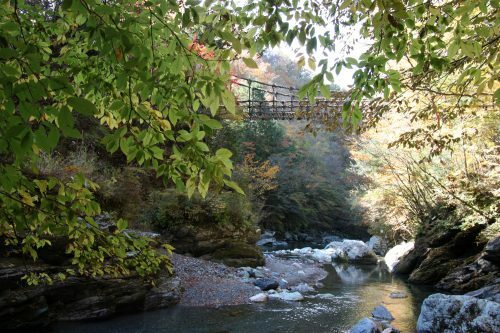 To continue your discovery of Shikoku’s natural landscapes, hit the road again to nearby Oboke Gorge. 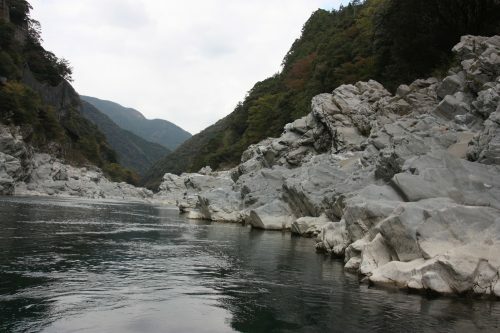 When you spot the mysteriously shaped white rocks framing the clear waters of Yoshino River from your car, it is time to pull over and continue your journey by boat. 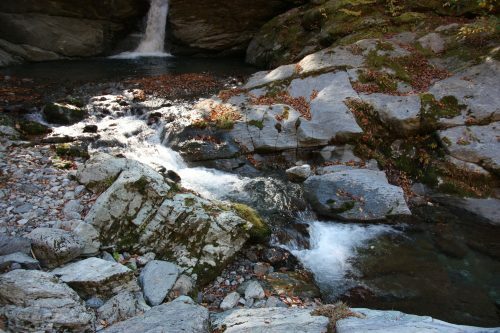 Registered as National Natural Treasure in 2014, and as Picturesque National Site a year later, the Oboke Gorge is a rare geological sight. The rock formations that you can see on each side of the river are the result of tectonic plates movements more than 100 million years ago! 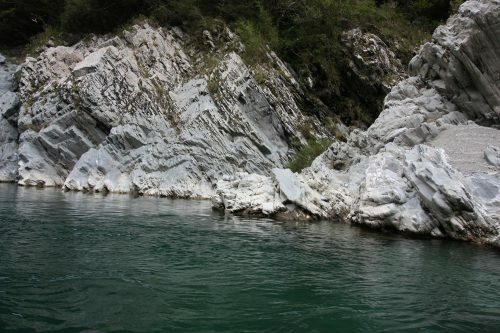 As you board one of the cruising boats offering a tour of the gorge, you will get up close to these fascinating natural sculptures, sometimes resembling animals. 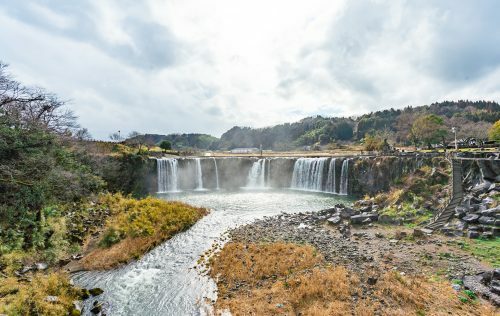 Depending on the weather and sunlight, the transparent waters of the Yoshino River will take on colorful hues, ranging from deep green to turquoise blue, postcard perfect. 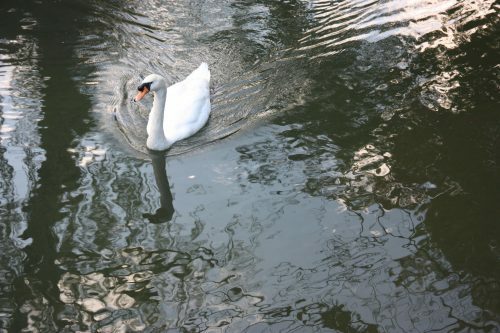 Throughout the cruise, you will be escorted by one or two birds of prey (kites) flying alongside the boat – as the captain attracts them with pieces of bread – as well as schools of curious carp. The cruise is a 30 minute tour in total that will give you a taste of the area. 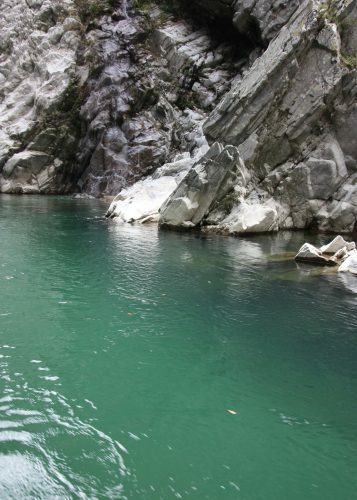 Depending on the season and your adventurous spirit, you can also opt for the rafting version of the Oboke Gorge tour, the Yoshino River being renowned as one of the best rafting rivers in the country. 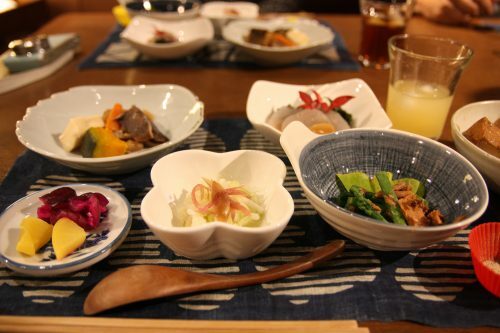 Returning from your cruise, make sure to stop by the Obokekyo Mannaka Restaurant to enjoy a delicious meal prepared with local ingredients. 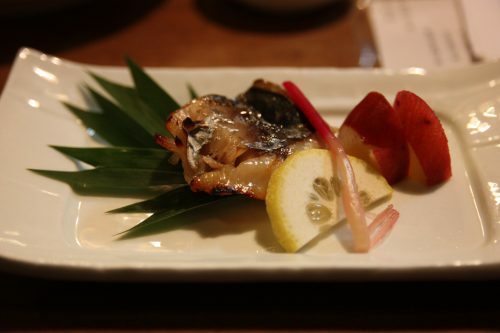 On the menu: grilled fish, soba noodles, a small nabe, and seasonal fruits. 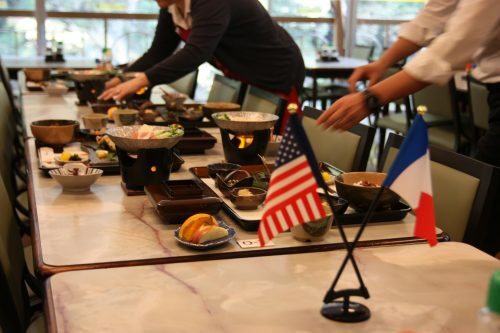 But what you will truly enjoy here is hospitality like no other place, with a caring staff paying extra attention to the details (I won’t spoil the surprise for you, but make sure to specify your nationality when you make a reservation). 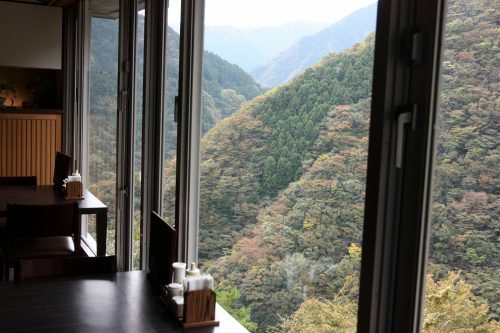 Nestled at the top of the gorge, your eyes will be as satisfied by the view as your taste buds will be by the food. 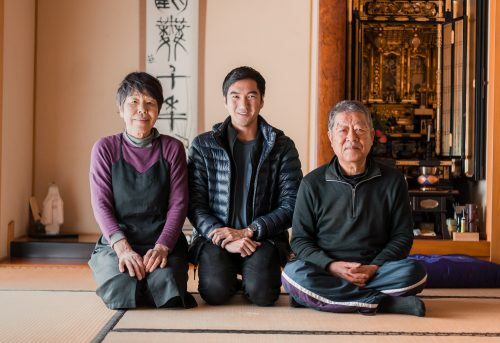 And because nothing compares to spending time with the locals when visiting the Japanese countryside, you can drive up the heights of Mima Town to spend the rest of the day and the night at a farmer’s guesthouse: the Yuzu No Sato minshuku. 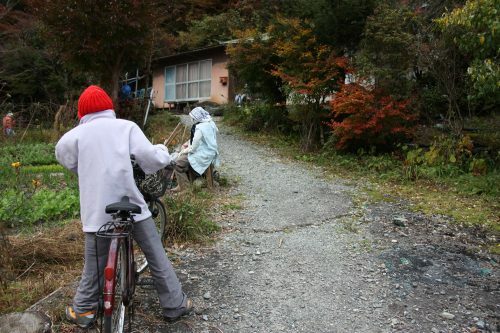 After driving through the small mountain roads of the area, you will be greeted on arrival by Shizuko-san, a former cashier with smiley eyes and a big heart, who decided to leave her urban daily life to get closer to nature and let others share in its treasures. 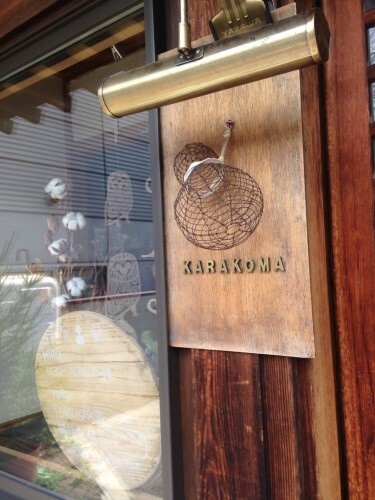 She will open the doors of her house to you and will make you feel just like at home. 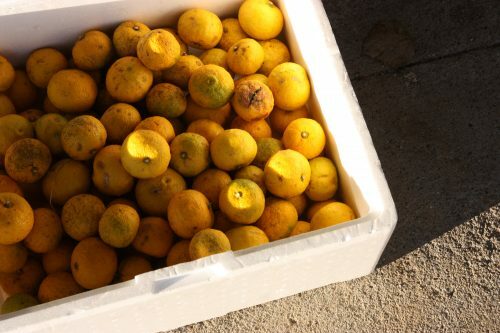 The end of October, during my stay, it was the heart of the yuzu harvesting season – this divine-tasting Japanese citrus. 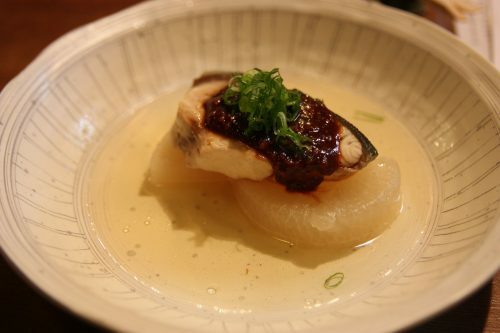 And the timing was perfect, because as the name of the minshuku suggests, its backyard is full of trees bearing the famous fruit! 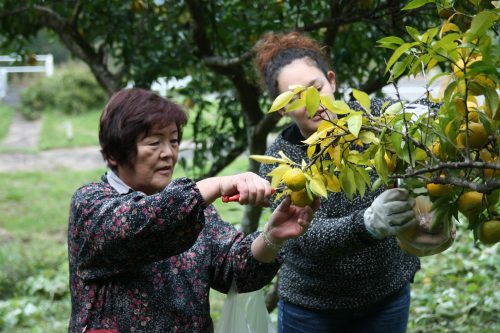 After equipping you with a pair of gloves, shears and a small bag, Shizuko-san will guide you to the backyard for a picking session. 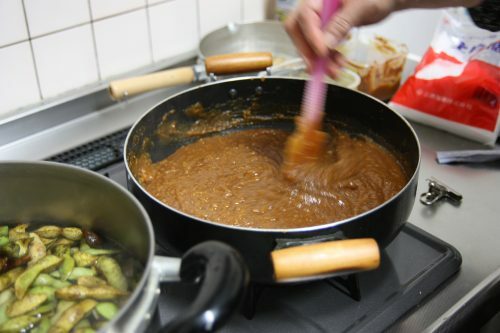 Once the bags are filled, it is time to head to the kitchen to help prepare a delicious yuzu flavored miso paste. 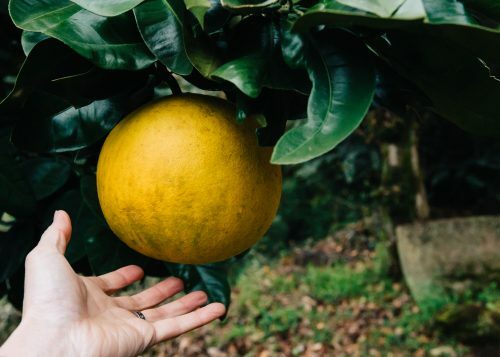 In the kitchen there are cupboards filled with pretty tableware, large bowls packed with vegetables from the garden and most of all the delightful smell of yuzu filling the air as you start peeling them. 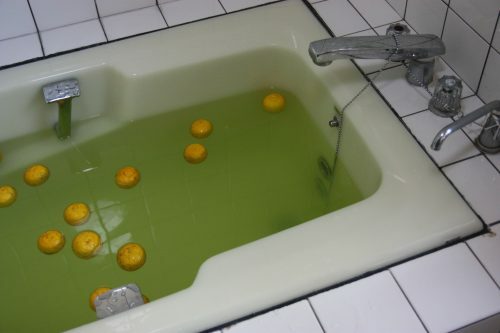 A few minutes spent in a hot bath (with yuzu in it too!) 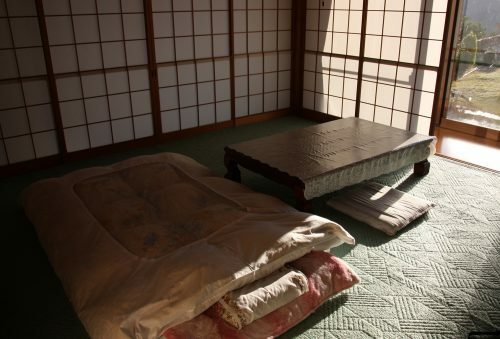 will help you to unwind completely before slipping in between a comfy blanket and your futon for a good night sleep. 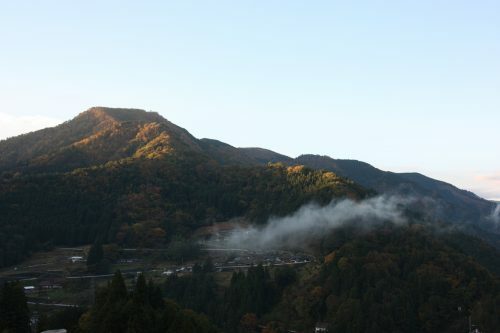 Following Shizuko-san’s advice, I woke up early the next morning to catch the first rays of sunlight appearing from behind the mountains of Mima before completely bathing the minshuku‘s garden with a warm golden light. Seated at the breakfast table enjoying another homemade meal, chances are you are reluctant to leave this small corner of paradise behind. 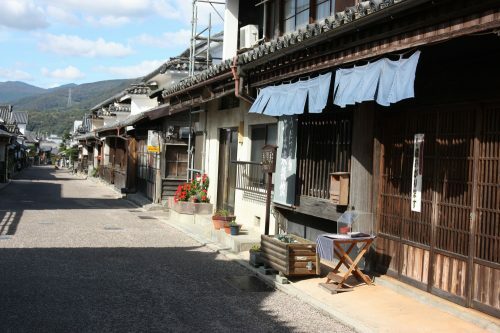 And yet, only a few minutes drive away is Mima’s charming historical district, Udatsu, which is worth stopping by. 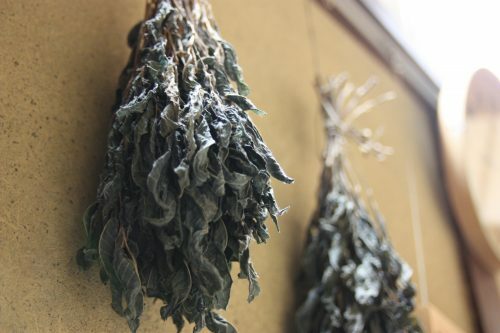 Having flourished in the Edo era as the birthplace of indigo dyeing, you can still walk around the very well preserved main street of this district today to get an idea of what Japan was like during the Edo Period. 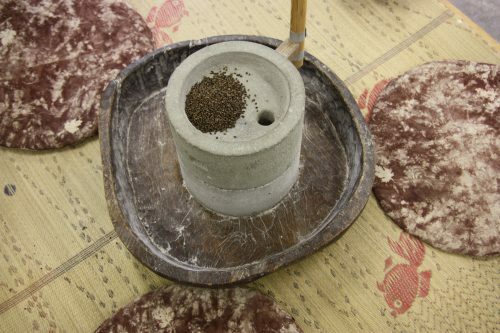 From traditional houses to local craftsmen workshops, you will find plenty to see and do. 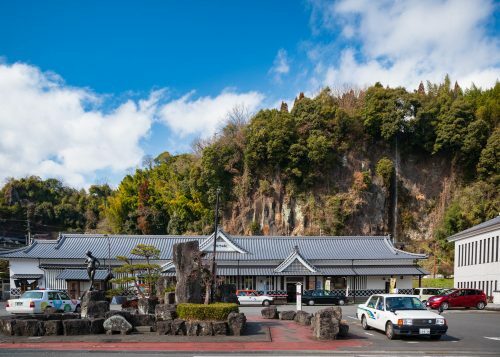 As you stroll down the main street, take a moment to observe the unusual architecture of the buildings, all equipped with a smart fire wall system – or udatsu, the word that gave the area its namesake. 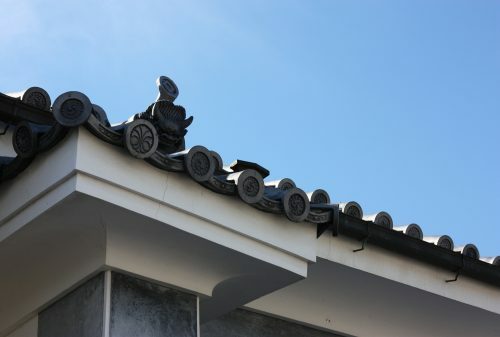 Each house is separated from its neighbor by an extra piece of wall made of clay, most decorated with a fish-gargoyle on top. 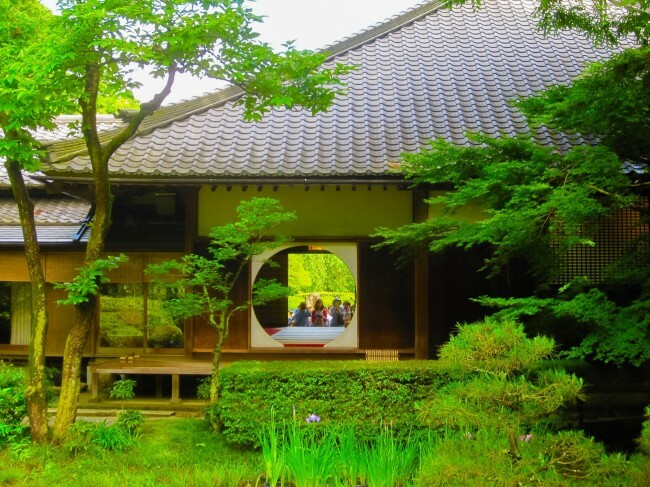 To discover what is hidden behind these beautiful house and store fronts, head to the former residence of the Yoshida family, a family of rich merchants. 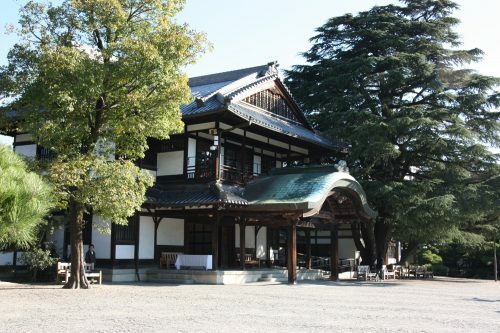 The Yoshida Residence is huge, with more than twenty rooms, including a kitchen typical of that era, and its own Japanese garden. 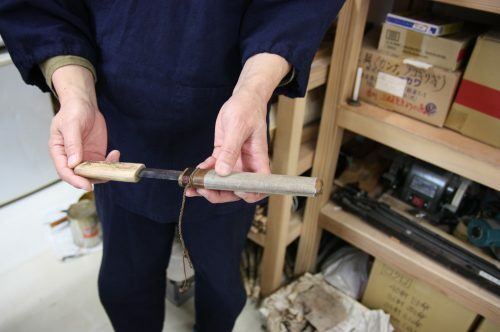 Udatsu is also worth visiting to learn more about the traditional local crafts. 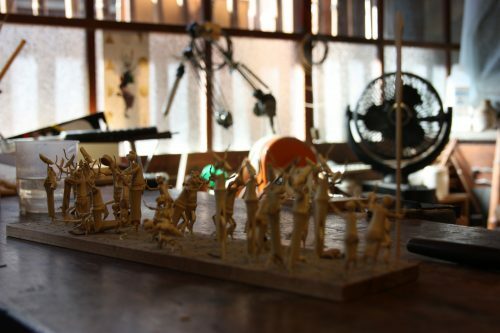 You can visit the shop of a bamboo sculptor who creates tiny dancing characters. 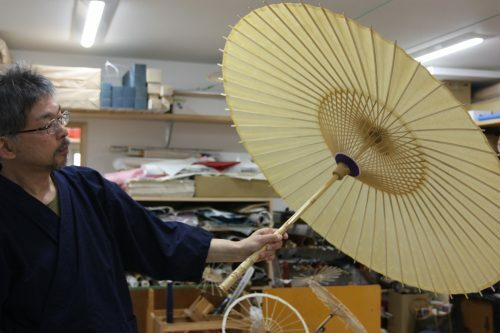 Or stop by Mima’s Traditional Crafts Center to learn about the manufacturing of traditional Japanese umbrellas, from the selection of the right wood to selecting the right tools for cutting it. 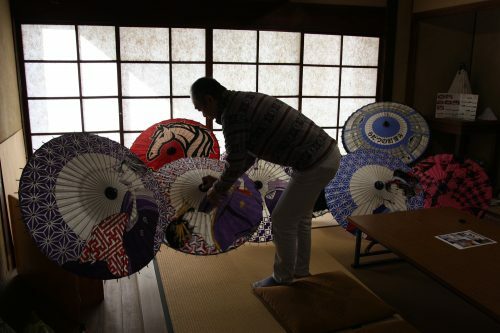 If umbrella decoration peaks your interest, you will enjoy meeting one of the rare umbrella illustrators in the region. 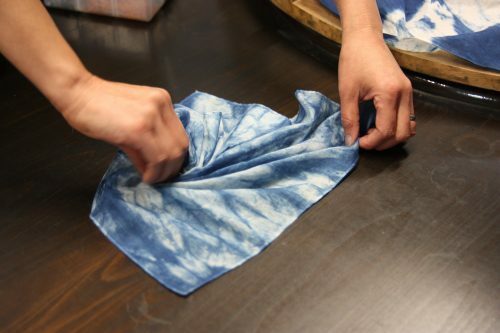 Mima’s most famous crafts are indigo-dyed products, and no trip would be complete without an introductory lesson in indigo dyeing. 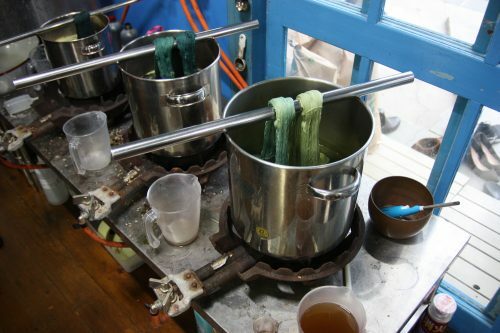 Indigo dyeing is a process that requires a bit of chemistry knowledge, something you will learn as you are taught what is needed for creating that perfect beautiful shade of blue. 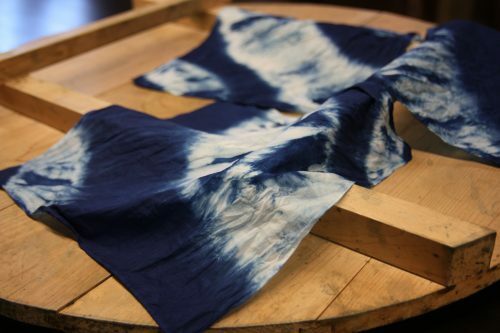 You will start by tying up your fabric to create the patterns that will remain white before submerging it into large tanks of indigo dye. 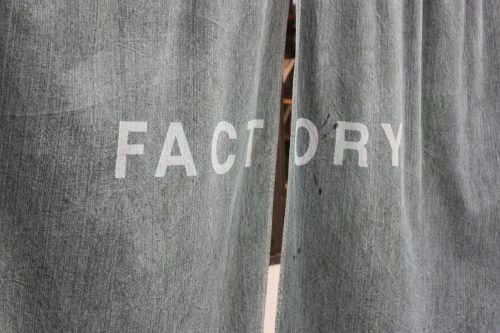 Depending on how dark blue you want your cloth to be, you will need to repeat the dyeing process a few times before placing your fabric in clear water to set the final color. 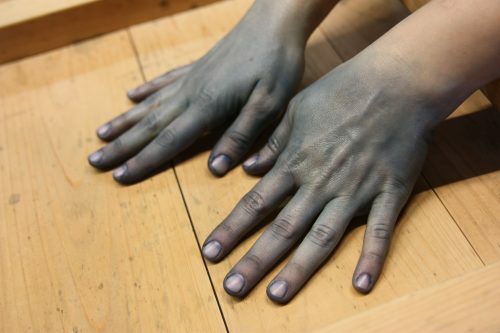 A workshop that is as educational as it is enjoyable, it will definitely leave you with a lasting memory, especially if you did not wear gloves! 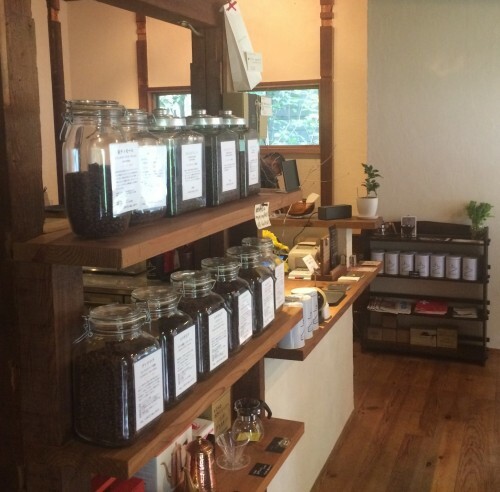 If you are in the Udatsu district around lunch time, check out the organic restaurant Sabo, located around the corner form the indigo dyeing workshop. 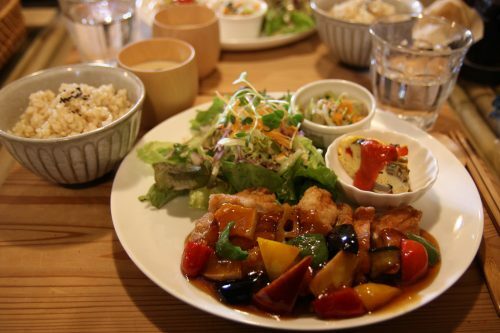 The lunch special is a hearty plate of chicken with a sweet and savory sauce and plenty of vegetables, in a charming environment with a thatched roof and a friendly staff. A real treat! 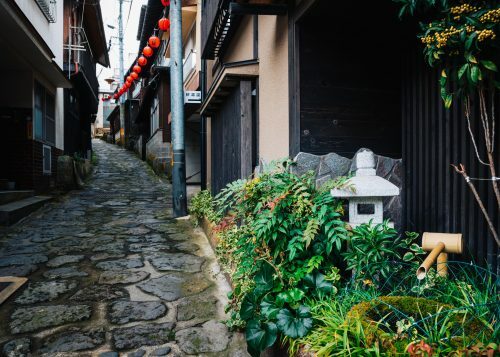 After a few days spent in one of the most secluded parts of Japan, it’s time to shift gears and visit the city of Takamatsu, located in the small prefecture of Kagawa. 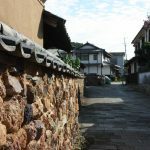 You will leave behind the narrow mountain roads and sometimes inclement weather to find a much more urban setting and mild climate in this city along the Seto Inland Sea. 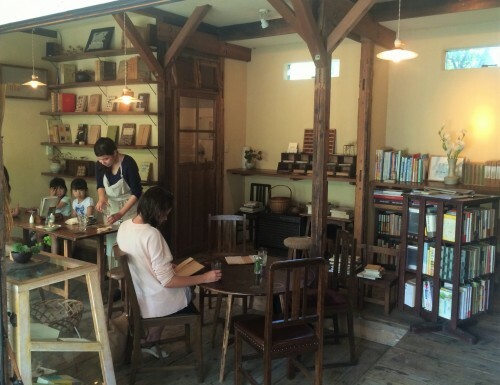 Takamatsu should be on your itinerary if you’re searching for a wealth of cultural activities and locales. 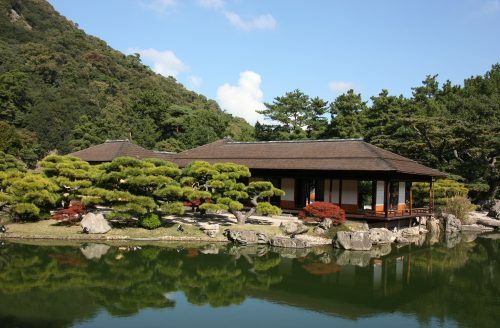 You can start your exploration of Takamatsu with a visit of the magnificent Ritsurin garden, the largest Japanese garden registered as a “Landscape of Exception”. 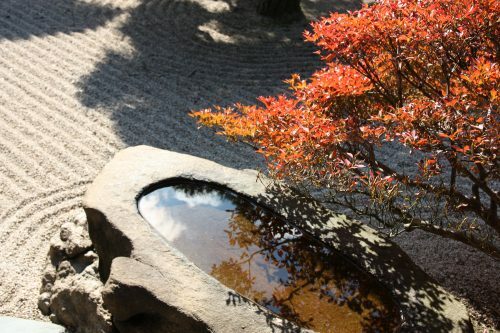 Even if you have been to other Japanese gardens, we can guarantee you that you have never seen anything like this one before. With six ponds and thirteen artificial hills spread over 16 hectares, you will definitely need several hours to take in the beauty of this garden in its entirety. A map of the garden is available at the entrance, and there are volunteer guides who can help you navigate this immense green oasis, as well as provide you historic information and anecdotes to make the most of your visit. 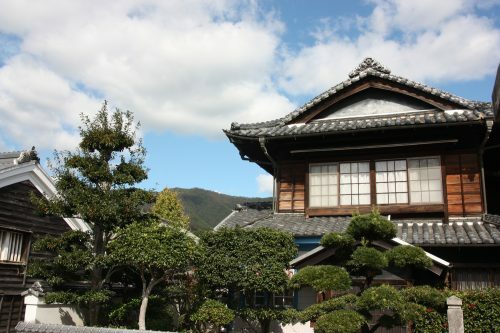 With a history dating back to the beginning of the Edo era more than four hundred years ago, it took over one hundred years finish its construction. 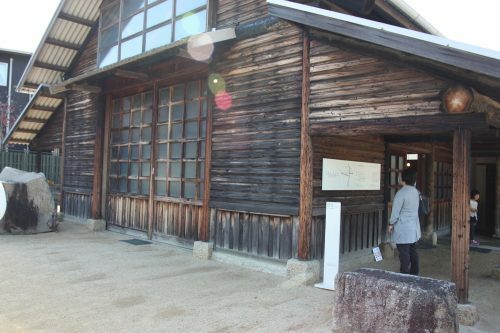 Eleven generations of lords from Takamatsu lived here before the park finally became open to the public in 1875 at the beginning of the Meiji era. 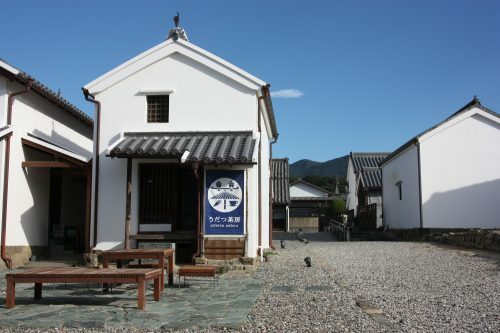 You can start your visit at the Shokoshoreikan, an impressive building with a traditional architecture transformed into a museum. 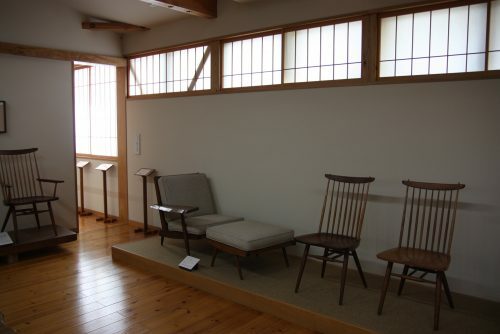 The first floor contains a few pieces of furniture from famous Japanese-American designer George Nakashima, along with a splendid view of the garden from the balcony. 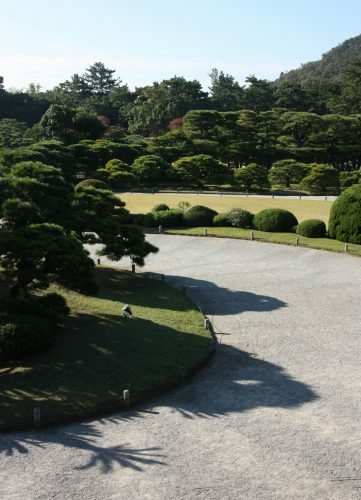 From that point of view, you will how perspective plays a large role in the design of the garden, with Mt Shiunzan as a background, even before you begin to stroll around the garden paths. 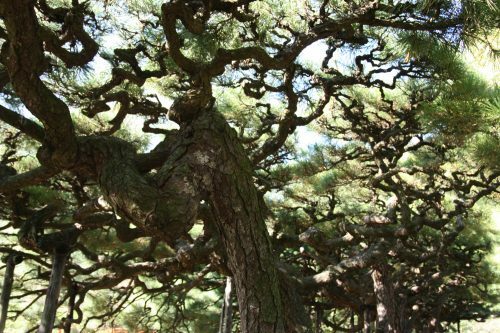 Among the main attractions of the Ritsurin Garden are the immaculately groomed pine trees (over a thousand in total!). 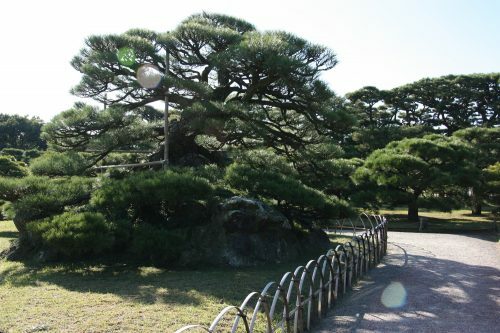 Although it is easy to spot the “Tsuru Kame Matsu”, the most beautiful pine of the garden standing tall on a turtle shaped rock formation, you will need a sharp eye to notice the details of the hakomatsu (pine trees shaped like a box) and the byobumatsu (pine trees with a black bark and intricate branches). 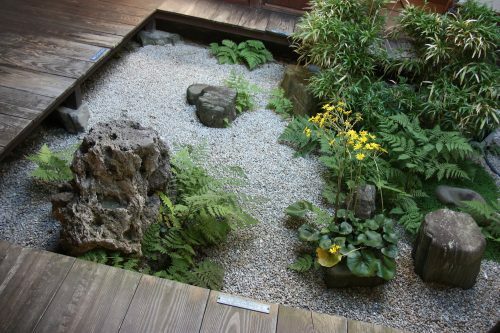 If you pay attention, you will soon discover this garden is a work of artistic planning, in which nothing was left to chance and where every element has a meaning, going beyond the simply functional or beautiful. 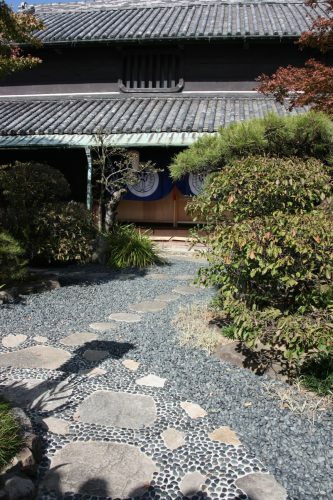 Consider the little stone steps leading to a tea house conceived as a path of transition to a place where you can leave your worries behind or the significance behind how the various bamboo fencing is shaped, using flexible pieces for a curved shape and a rigid poles for straight rails. 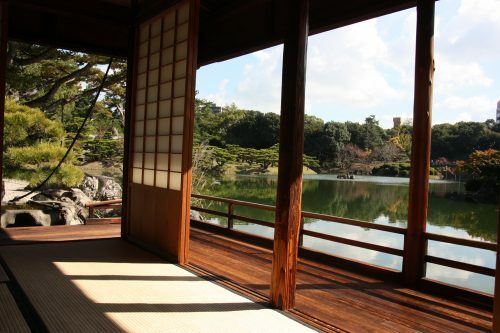 Make sure to take a break at one of the garden’s several tea houses, the Kikugetsu-tei, where you can enjoy a moment of rest while sipping a cup of matcha tea as you silently take in the magnificent views. 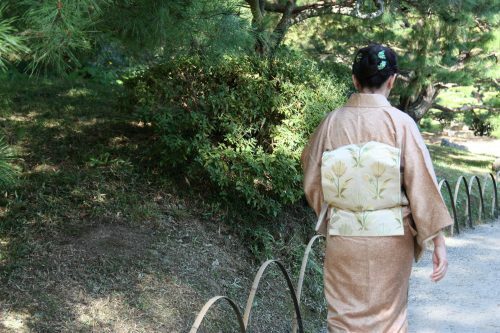 My guide started the visit by explaining that the beauty of Ritsurin garden was not simply something to be seen, but needed to be felt. Beyond sharing words and pictures with you, I recommend that you go and experience it for yourself. 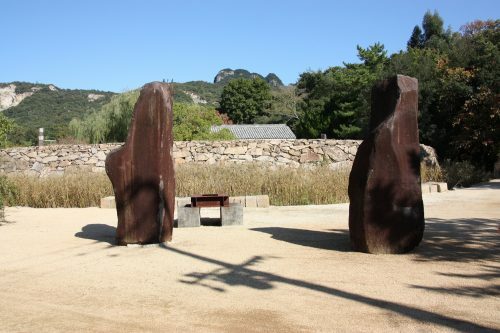 You can continue your cultural tour of Takamatsu by discovering the works of art of two major Japanese-American artists who were visionaries of their fields: George Nakashima in furniture design and Isamu Noguchi in rock sculpture. 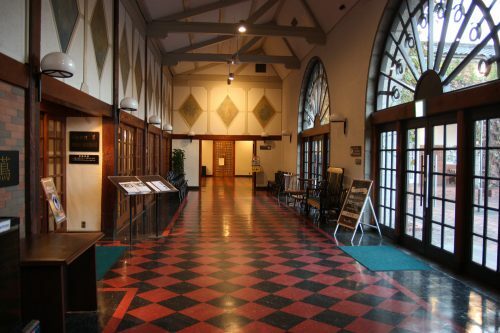 The George Nakashima Memorial Hall retraces the career of the former architect, who preferred the title of “wood worker” rather than designer. 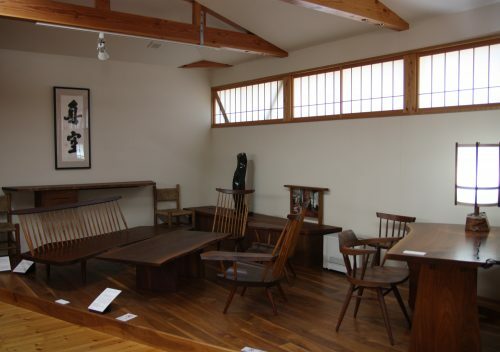 Though his main studio was located in Pennsylvania, George Nakashima opened his second workshop in Takamatsu, where he used to collaborate with a collective of local craftsmen on the modernization of century old furniture making techniques. 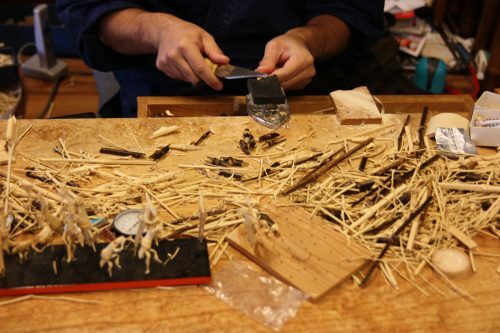 This workshop is home to a large collection of his creations, from the most famous ones such as his two legged chairs, to the rare and unique. 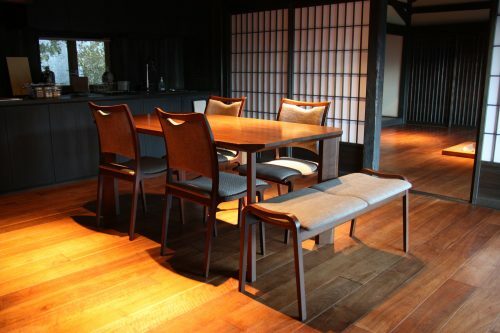 Nakashima created a collection of modern and ergonomic works of art which truly highlight the nobleness of wood. 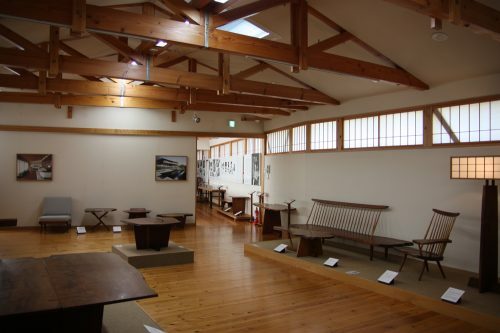 At the Garden Museum dedicated to sculptor Isamu Noguchi, you will be able to see the studio in which the artist used to come to work several months every year, thousands of kilometers away from his native country, the US. 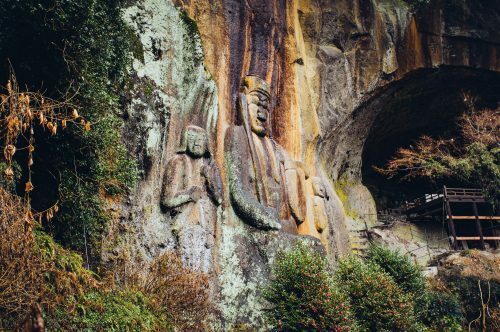 By reservation only, you can tour his former residence, his workshop and a collection of 150 of his sculptures, some of which remain unfinished works. Among the most impressive of his art pieces, don’t miss his fascinating sculpture made of black granite, “Energy Void”, measuring more than 3 meters high. 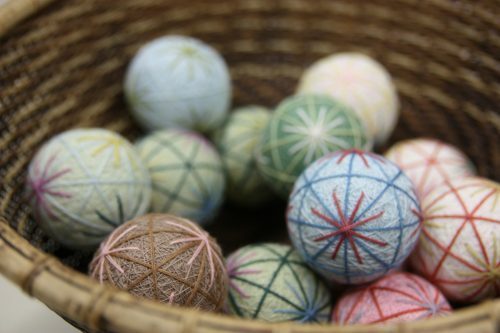 If your interests tend toward traditional crafts, you can learn all about Takamatsu’s unique embroidery techniques on temari, small colorful balls made of cotton which were originally made as toys for children. 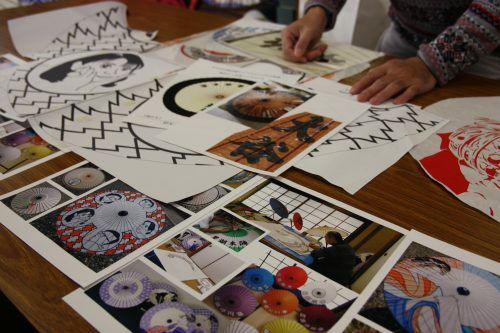 Head over to the Sanuki Kagari Temari (techniques specific to the crafting of temari in Takamatsu) Preservation Association office to discover the secret century-old techniques behind this delicate craft. 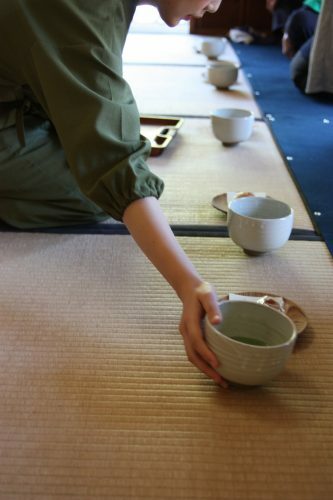 You will be instructed by a passionate team who truly are committed to pass on their knowledge of this rare craft. 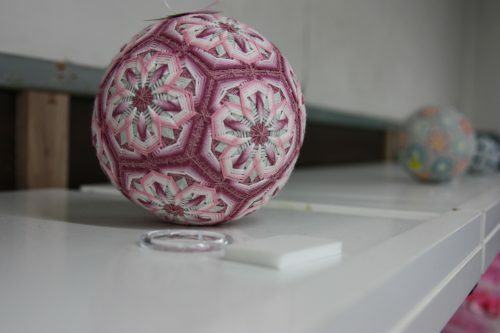 During the workshop, I was advised to create a hemp leaf pattern embroidery, which is a simple pattern for a beginner. 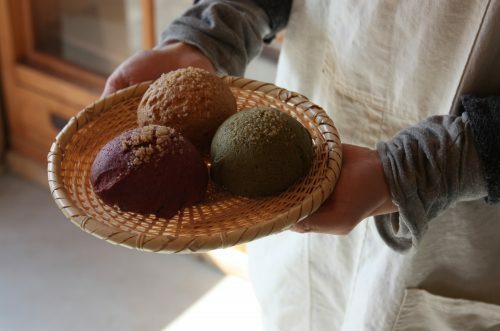 After the workshop, drop by the adjacent building where the cotton threads used for temari making are being naturally dyed. 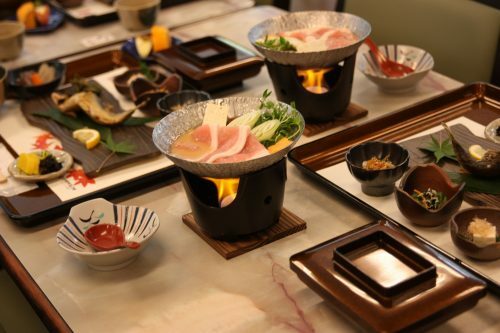 To satisfy your appetite as much as you have satisfied your creativity, indulge yourself in a hearty bowl of udon for lunch at the Yamadaya restaurant. 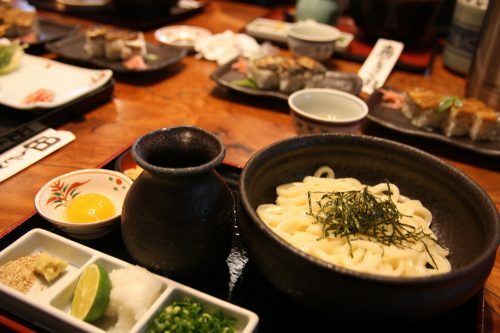 A classic Japanese cuisine, enjoy your udon meal in a traditional setting with a building adjacent to a small Japanese garden. 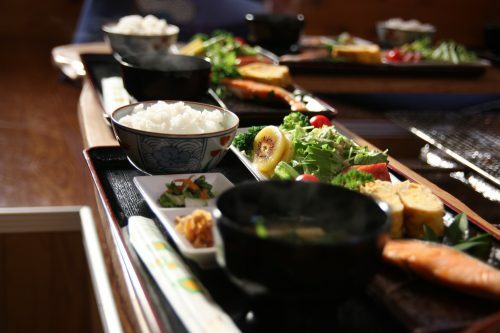 For dinner, why not try an izakaya-style meal at Renge Ryouriten restaurant? 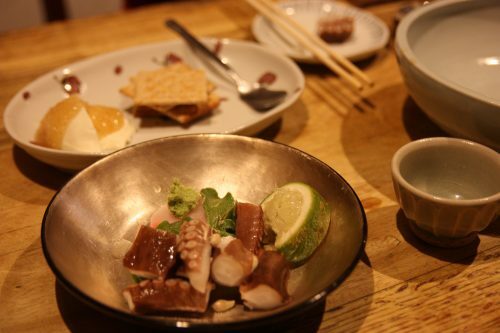 Among the dishes to share around your table: sashimi, tuna and avocado toast, tofu cheese and gyoza. 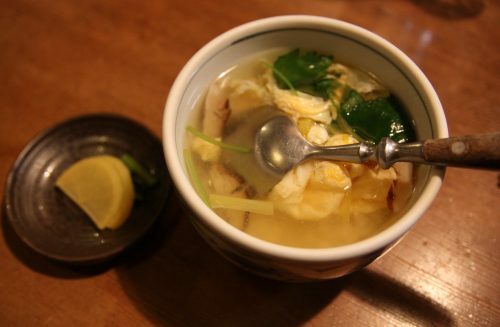 Order your food with a refreshing beer or a glass of homemade ginger ale to wash it down. 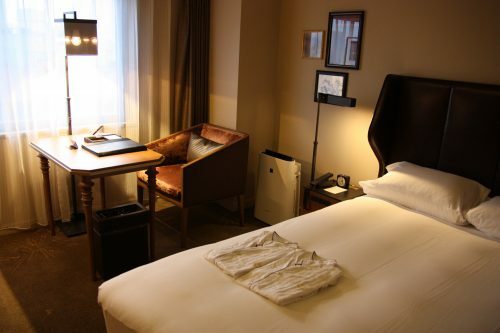 At the end of a long and wonderful day, a night spent at the Royal Park Hotel, located in the city center, will offer you a well deserved pampering. 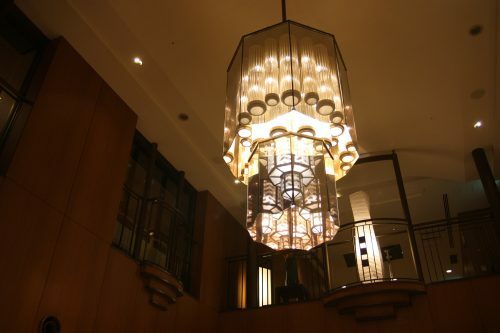 In this world class hotel, you will stay in a tastefully decorated room equipped with all the modern amenities. 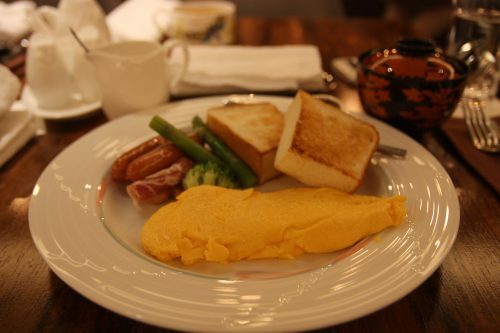 For breakfast, you will have the choice between a Western style or Japanese style menu, complemented with a buffet of fruits and pastries. 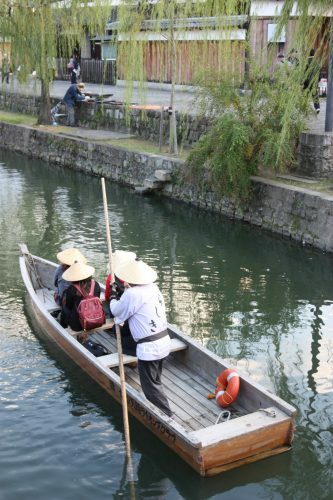 On your way back to Honshu, the main island of the Japanese archipelago, be sure to make a stop in Kurashiki, a city located in Okayama Prefecture. 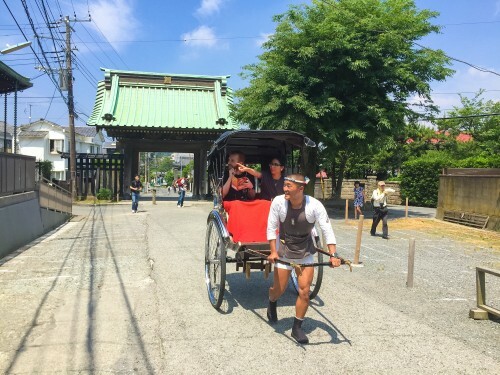 After driving across the impressive Ohashi Bridge over the Seto Inland Sea, you will only be a few kilometers away from the scenic Bikan historical district, the main sightseeing destination of Kurashiki City. 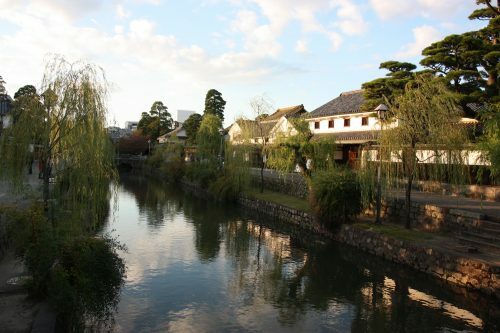 With canal lined with merchants’ homes and warehouses, the Bikan district in Kurashiki once flourished during the Edo era as an important trade center in the region, especially for cotton. 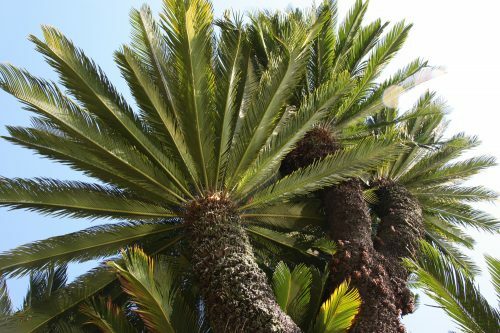 Registered since the late 1970’s as a Preservation Zone for traditional buildings, the district is impeccably maintained with an authentic atmosphere of its original era. Weeping willows sway lazily over the canal, traditional boats glide on the water, and small houses with their immaculate white walls glow in the afternoon sun. 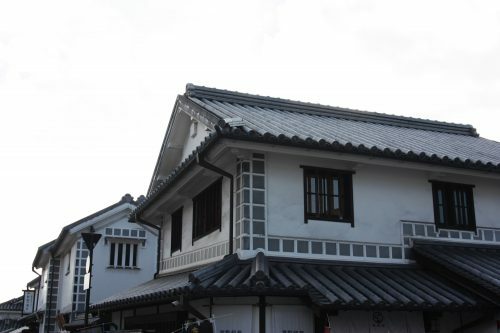 This historical quarter was damaged by the heavy rainstorms and typhoons of the Summer of 2018, but no trace of damage can be found today.. Its charm has even been preserved to the point that overhead cables were routed underground a few years ago so that nothing spoils the idyllic landscape. 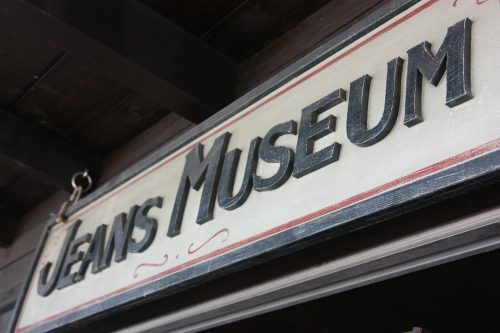 Museums dedicated to Western art, archeology, Folklore craft, ancient houses of rich merchants, and traditional boat tours are all ways to experience the culture of this lovely area. 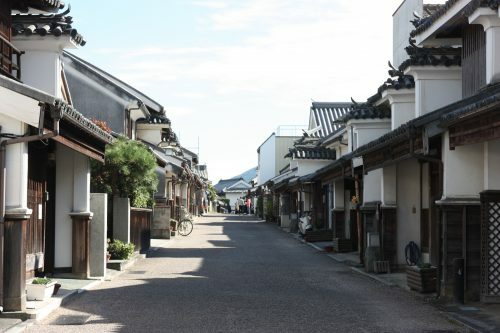 If you are short on time, simply take a stroll around the lovely typical streets that will transport you to a Japan from the Edo Period. 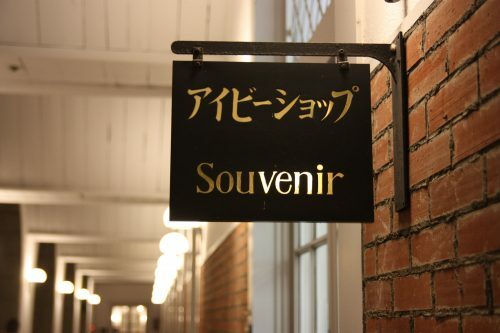 Many cute shops and cafés beckon, teasing you into spending just a few minutes inside them until you forget where the time went. 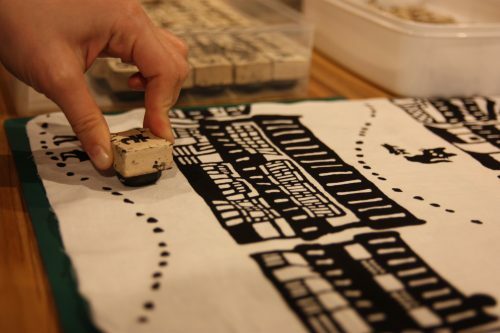 In one of Kurashiki’s Craftwork Village shops, you will be able to customize your own tenugui, a small hand towel, using little rubber stamps and a special ink made for fabric. 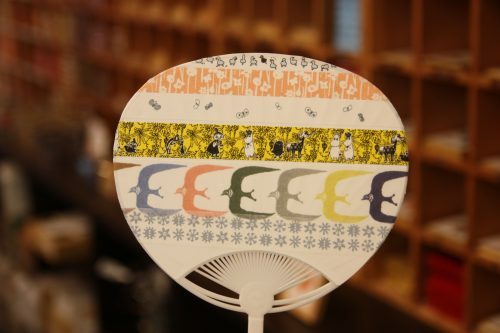 It is a nice way to create a unique souvenir to bring home from the city, your tenugui decorated with drawings of the Bikan’s typical store fronts along with your personal touches. 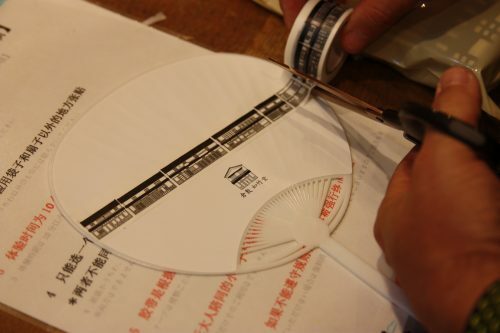 For stationery enthusiasts, I highly recommend the Nyochikudo shop located a few meters away on the same street. 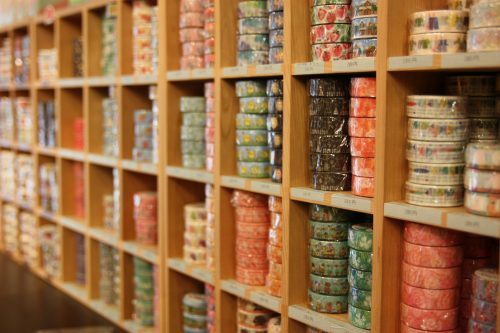 Here you will enter a washi tape paradise: small rolls of rice paper tape covered in kawaii (cute) patterns. 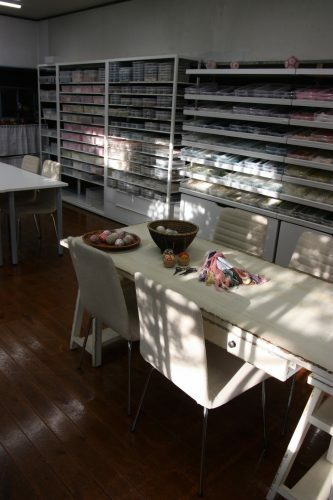 Need a good excuse to stick around a little longer in this shop filled with fun and colorful tapes? There is a free customization stand available for customers! 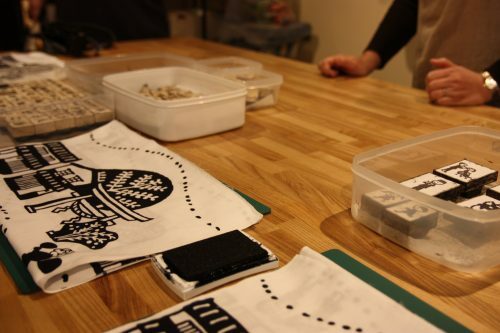 After choosing what to customize, either a paper bag or a fan, you will be able to pick the washi tape you like among a large selection to customize your free souvenir. 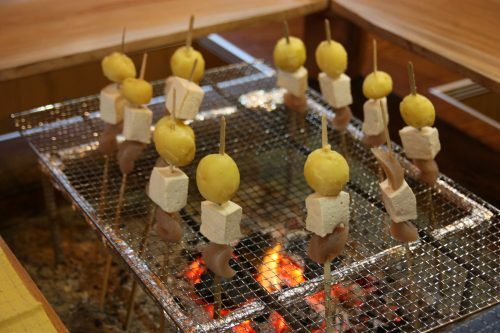 If all the shopping is making you hungry again, it may be time for a snack. For a memorable sweet snack, go get a taste of the cute Happiness Pudding at the Yuurin-An Café! More than just regular pudding, this is a pudding experience! 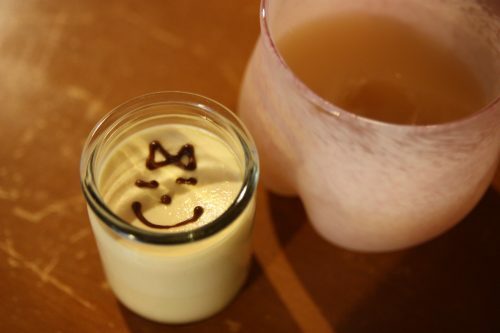 Served in a small glass jar and decorated with a smiley face, you will first select which pudding you want to eat according to the face you like best. 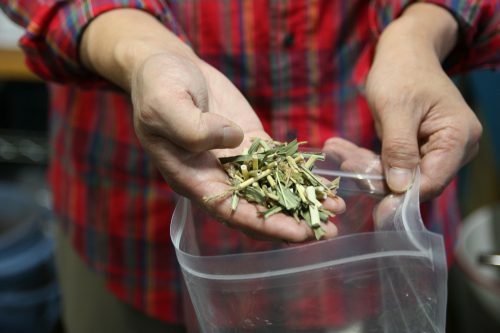 You will then be invited to take a picture of it and take your time to savor it. 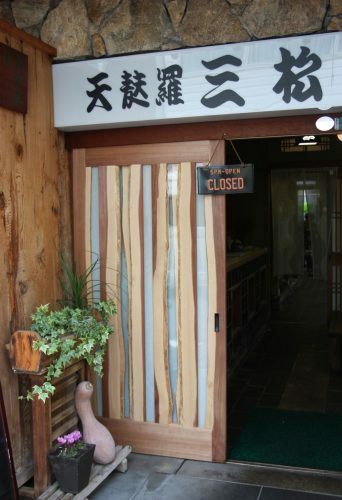 Two weeks later, you will still be associating the pudding’s sweet taste to your memories of Kurashiki. 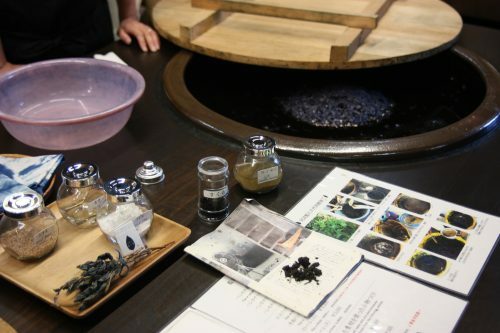 With a happy belly, you can resume your stroll through the Bikan district or choose to explore another part of Kurashiki close by in the Kojima district, the birthplace of Japanese jeans. 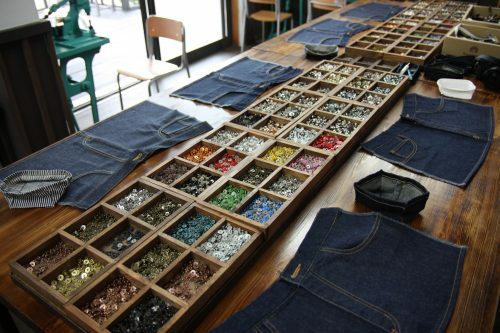 It may surprise many tourists to discover that Japan has made a name for itself in the jeans industry. 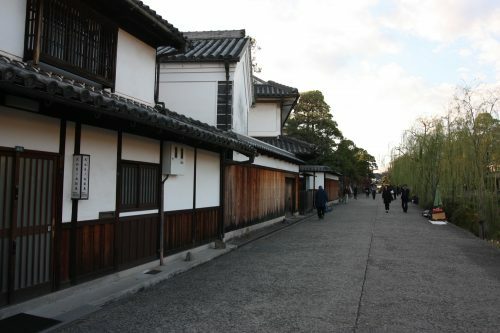 However, Kurashiki is a city that developed an early expertise in the textile industry thanks to its cotton trade. 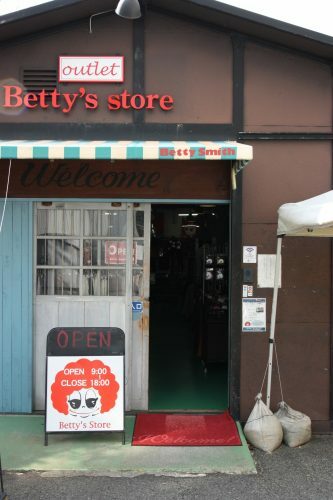 By visiting the two branches of the Jeans Museum and exploring the factory of the local jeans brand, Betty Smith, you will learn all there is to know about the Japanese jeans industry. 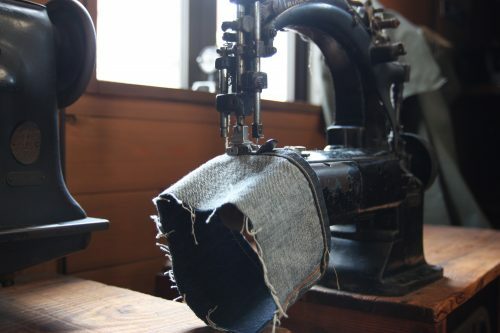 You may wonder what it is that sets a pair of Kojima jeans apart from other jeans. 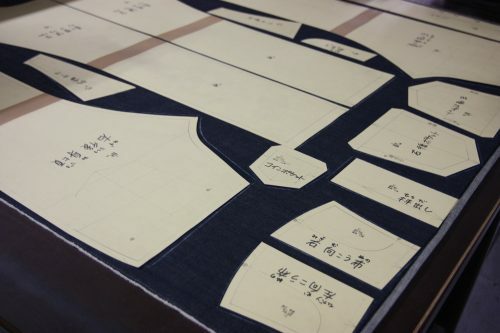 The answer is in their unique 100% tailor-made offer, allowing customers to fully personalize their own jeans (an offer which, of course, doesn’t come cheap). 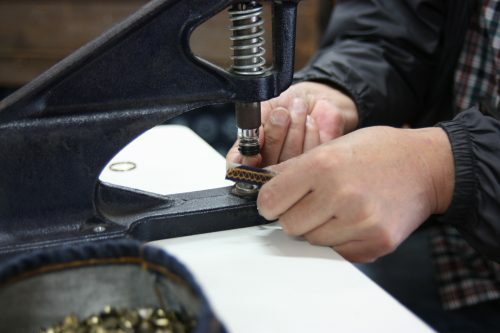 If a custom pair of jeans is out of your budget and timeframe, you can still leave with a unique souvenir from this district of Kurashiki by taking part in a quick workshop to make a key strap from scraps of fabric from the nearby jeans factory. 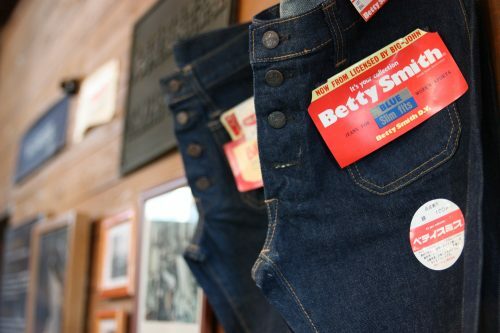 If you prefer to buy your jeans off the rack, stop by the Betty Smith Outlet. 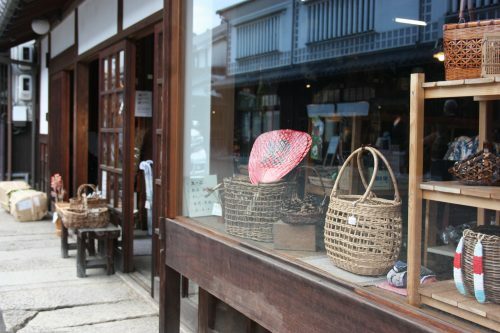 Overall, this part of Kurashiki offers a rather unusual experience that should please fashion and textile fans. 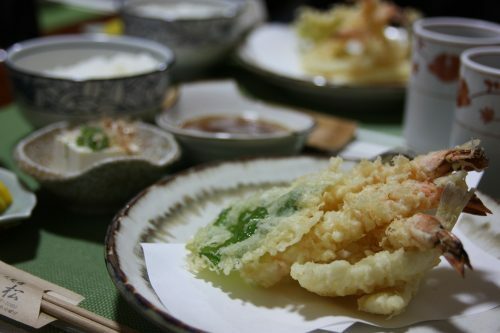 For the foodies, you will get to enjoy some tasty tempura at Tempuran Kappou Mimatsu, a restaurant organized into small rooms separated by sliding doors, where you have lunch on small tables while seated on the floor. 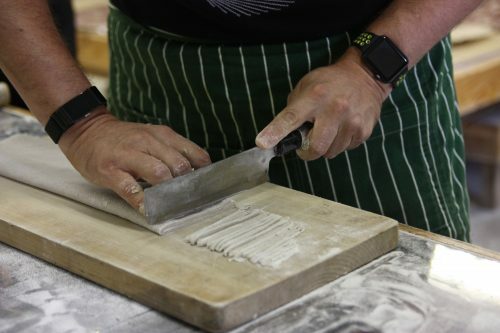 This is a perfect option to grab a quick and delicious bite in an authentic setting. 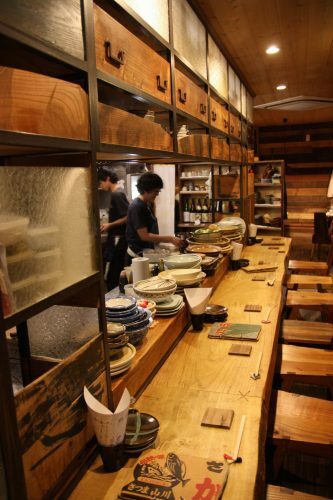 And if you find yourself in the Bikan district as the night falls, you can head over to the 民芸茶屋 新粋 izakaya and its multiple course menu. 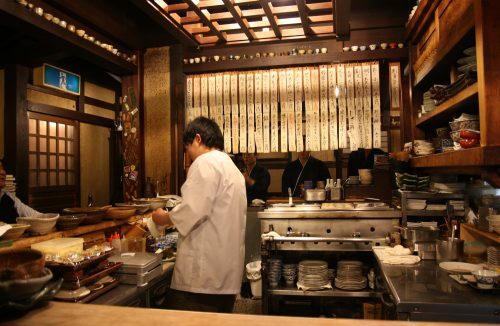 Seated at the counter around the open kitchen, the chef will prepare you a parade of dishes, each one more mouth-watering than the last. 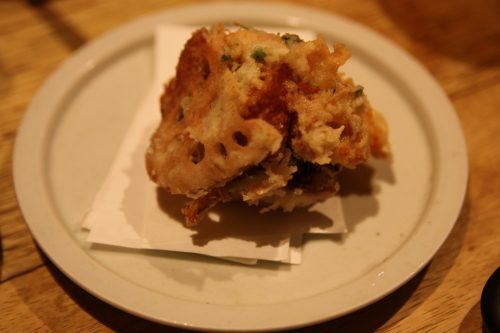 I personally enjoyed one of the starters, a sesame tofu covered in a creamy sauce. A delightful treat! 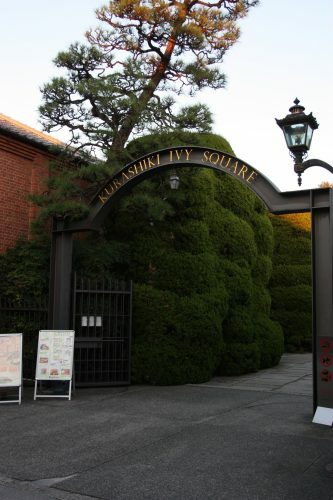 To spend the night in the heart of Bikan in an unusual setting, you can book a room at the Kurashiki Ivy Square Hotel. 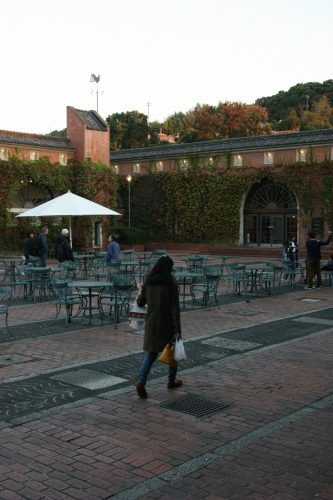 The hotel is an converted old industrial building that you will immediately spot with its red brick walls covered in ivy. 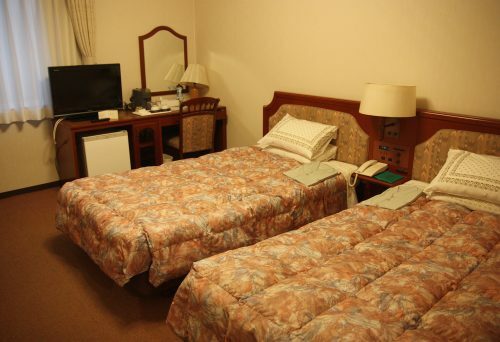 If the Standard rooms feel slightly old-fashioned (upgrade to the Deluxe room for more comfort), the building and its garden offer a charming environment to stay in. 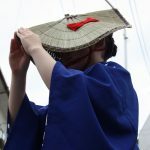 Although the small island of Shikoku might not seem easily accessible at first, its eastern part is actually quite close to major cities such as Kyoto or Osaka. 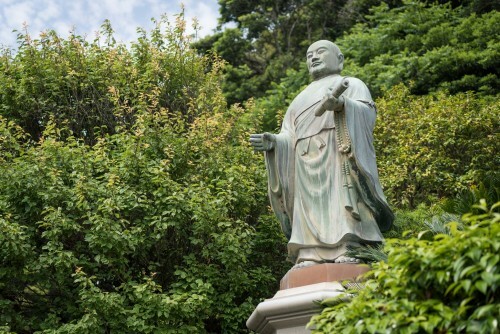 If you come from further away, check the flights to Shikoku, as the cities of Takamatsu and Tokushima both have airports close to the city center. 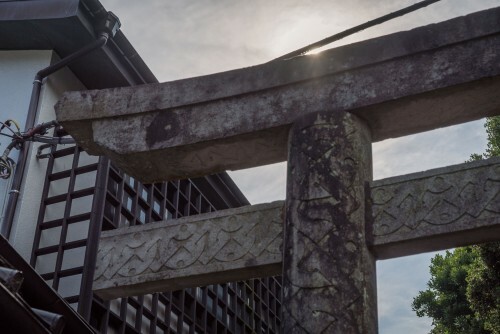 Below you will find an estimate of the travel times to reach the several destinations introduced earlier from a few of Japan’s main cities. 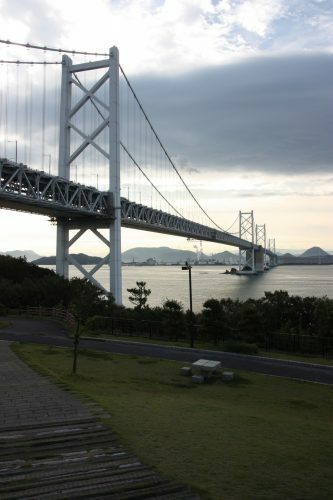 From Tokyo : About 5h by train to Awa-Ikeda station or 1h20 by plane from Haneda to Takamatsu airport, plus a 1h15 drive to Awa-Ikeda station. 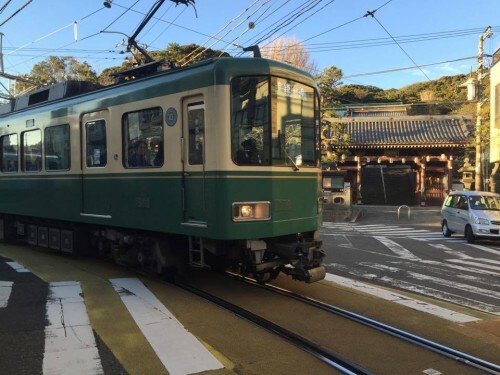 From Osaka : 2h30 by train from de Shin-Osaka station to Awa-Ikeda station or 3h50 by bus. From Kobe : 2h30 by car, 3h by bus. 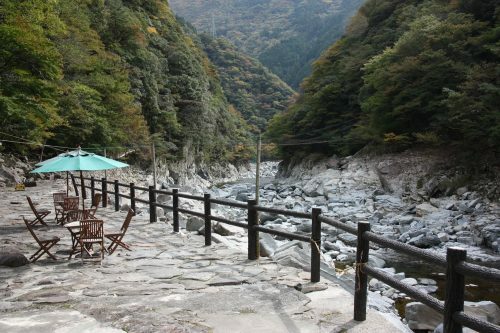 Once you have arrived at Awa-Ikeda station, you will need several more minutes by car to reach the various sightseeing spots of the Iya Valley. 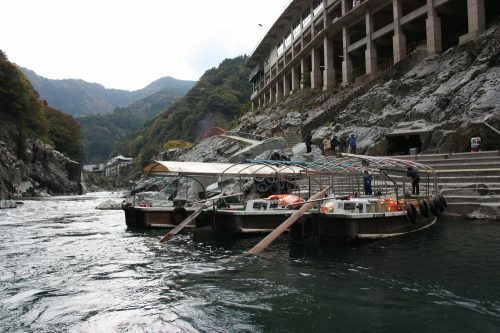 For example, you will need more than two hours to get to the double vine bridge of Oku Iya or 40 minutes to the Oboke Gorge. From Tokyo : About 1h20 by plane from Haneda to Takamatsu airport, followed by a 40 minute drive to reach Wakimachi station. From Osaka : About 3h50 by train to Anabuki station (the closest one to Udatsu), 3h by bus to Mima station or 2h30 by car. 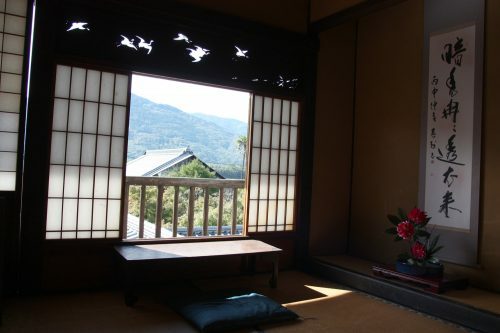 From Kyoto : About 4h by train Anabuki station or 3h30 by bus Mima station. 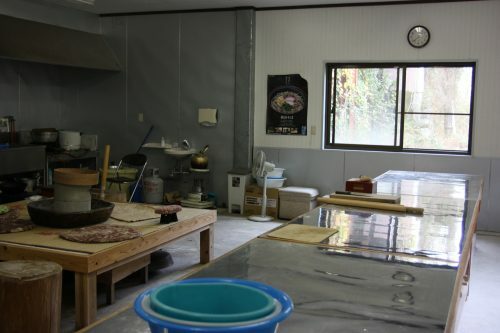 You can easily travel by train from the center of Mima to the Udatsu district. 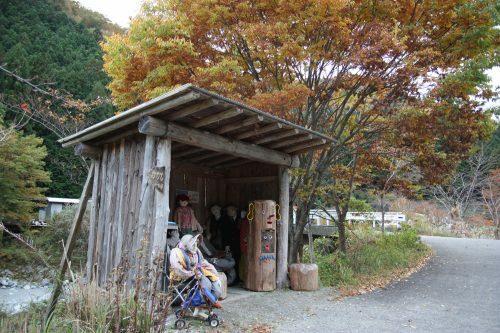 However, if you wish to have a minshuku experience in the countryside, make sure to book a taxi or a rental car. 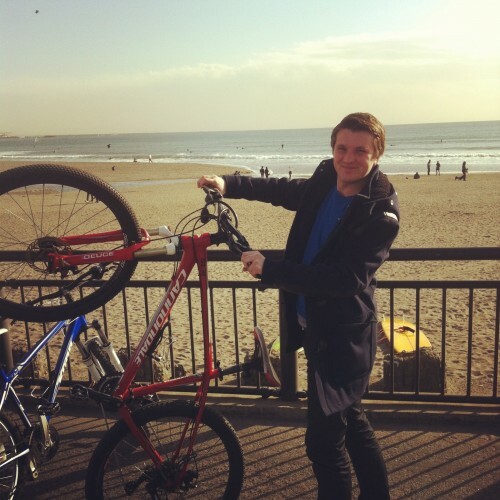 From Tokyo : About 4h15 by train, 1h20 by plane from Haneda, or 9h45 by bus. 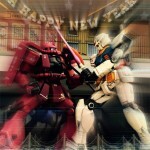 From Osaka : About 1h45 by train from Shin-Osaka station or 3h30 by bus. 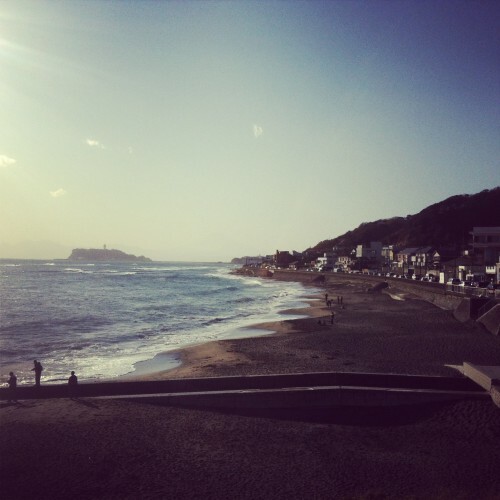 From Kobe : 2h50 by bus or 4h by ferry. From Tokyo : 1h10 by plane to Okayama airport, followed by 45min of public transportation to reach Kurashiki station or 11h by bus. 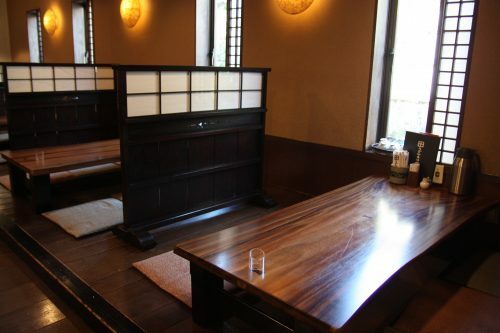 From Osaka : About 45min by shinkansen from Shin-Osaka station or 3h45 by bus. 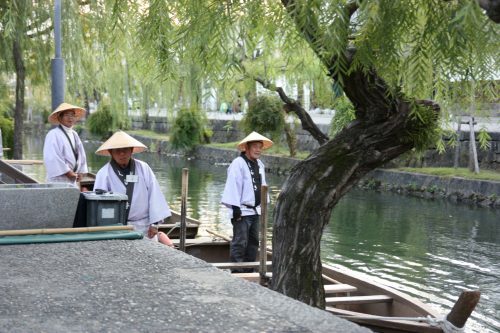 From Kyoto : 3h50 by bus.